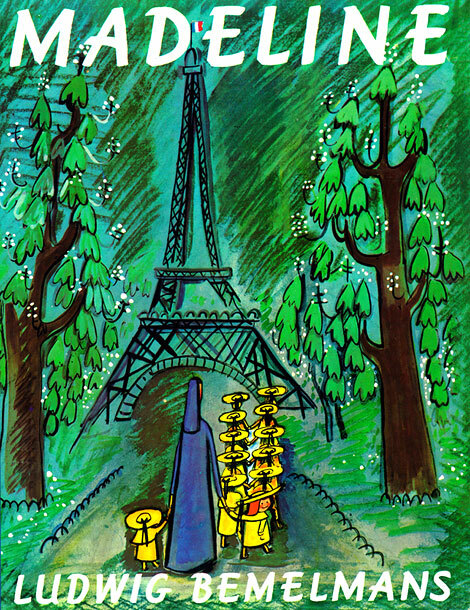 During the week of June 15th to the 19th we explored the world of Madeline by Ludwig Bemelmans. This was in the plan for last year but I kept putting it off because I wanted to figure out some more interactive ways to teach some of the concepts. Day one was spent talking about the human body. 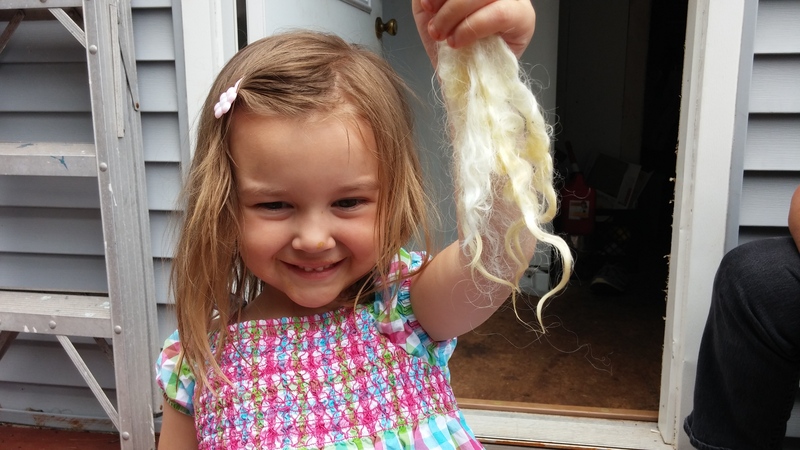 My kids are very curious about this kind of thing and are always asking questions about it. I am a science teacher and enjoy watching surgical shows on television, so we have talked about it A LOT before. 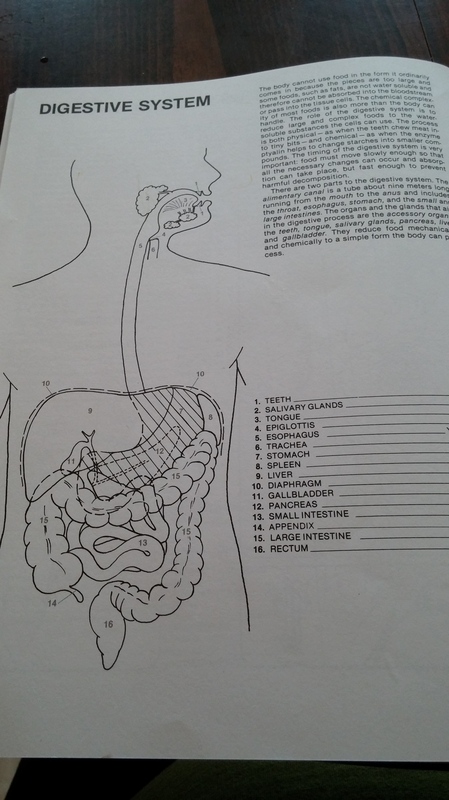 We used my five-year-old’s anatomy coloring book (a Christmas present) to discuss the structure of the digestive system in particular because Madeline gets her appendix removed. We traced the flow of food through the system and then we ate lunch and talked about what the food was doing as we swallowed it. 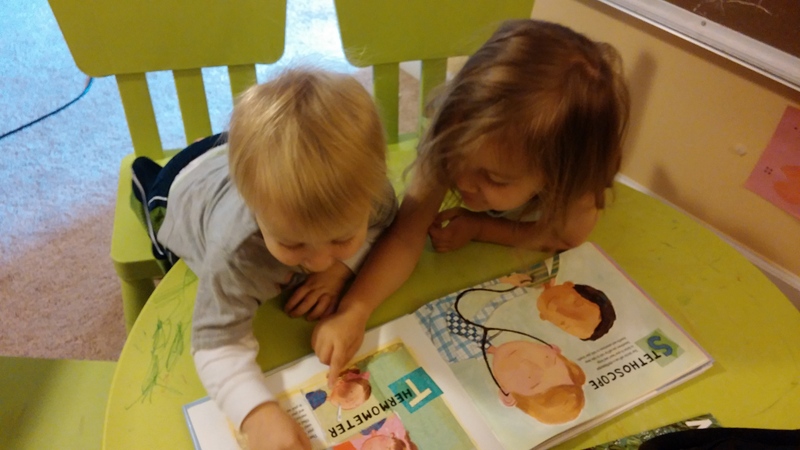 We looked through a children’s book on anatomy called The 3D Body and talked briefly about the other systems. Bo had lots of questions about the nervous system and how the brain works. After Maggie went down for her nap, Bo, his father and I had a talk about mental illness and how it is different from other illnesses. 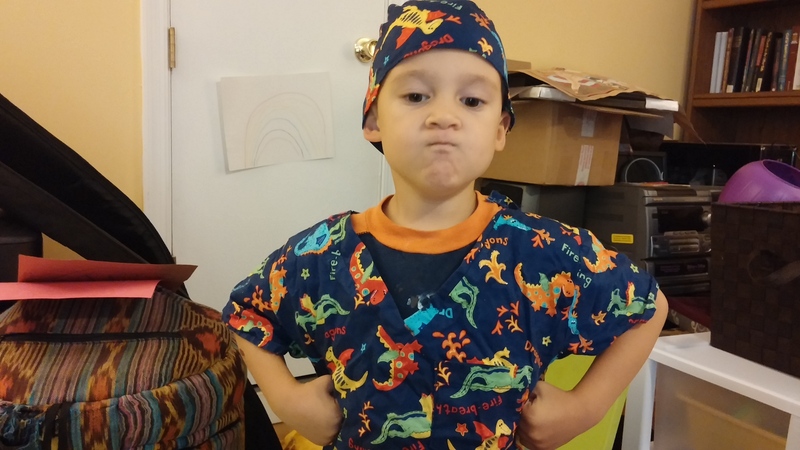 We made a big deal about telling him that people with issues like anxiety, depression and the like feel a great deal of shame but they are diseases like a cold or sore throat. I think it’s very important for my children to understand that if they start to feel those things, they will still be loved and supported by their parents. Lots of talking on Day One. Definitely needed more interactive activities. Day Two was a mishmash of a couple of days because we had a day full of errands and doctors appointments on Monday and we were a day behind. We talked about health and doctors first. I found a book called ABC Doctor which was a simple way to talk about things to expect at a doctor’s office. We didn’t really read it, but we went through the letters (like O is for otoscope and U is for urine sample) and talked about them. 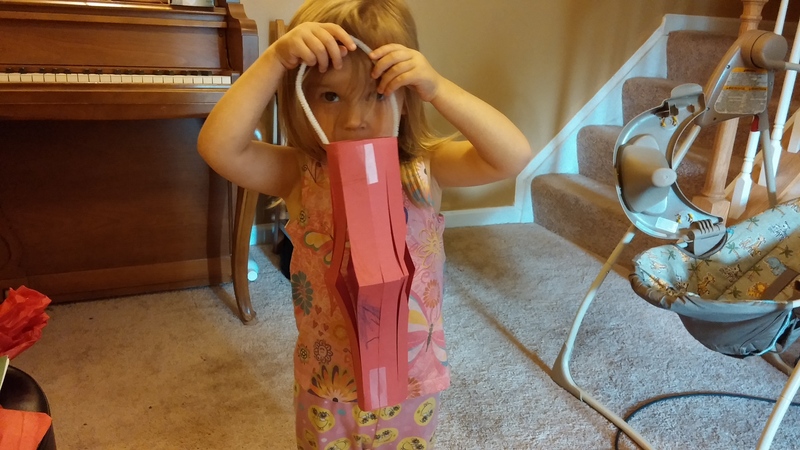 I also brought the awesome play doctor kit my mom made for Maggie for Christmas which included quite a bit of real doctor tools – a working otoscope, a stethoscope, a sphygmomanometer (blood pressure cuff) and a variety of other things. As we learned about these tools, we practiced using them and talking about whether or not they hurt. We measured our temperatures using a thermometer and talked about medicines. Even Joe was paying rapt attention to this. He was mad when we stopped taking temperatures though. Finally, we talked about how we can stay healthy. 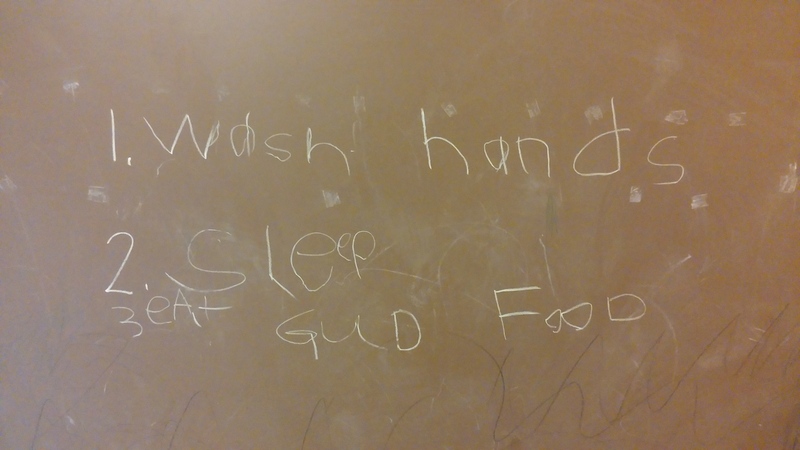 I had Bo write on the board a list of three important things to stay healthy. (Wash your hands. Get good sleep. Eat healthy foods.) We practiced proper hand washing technique by singing our ABC’s as we washed. We talked about when we should wash our hands. Then we discussed healthy and unhealthy foods. They are more conscious now of what veggies and fruits we eat – they even asked for a vegetable with their pizza for dinner. 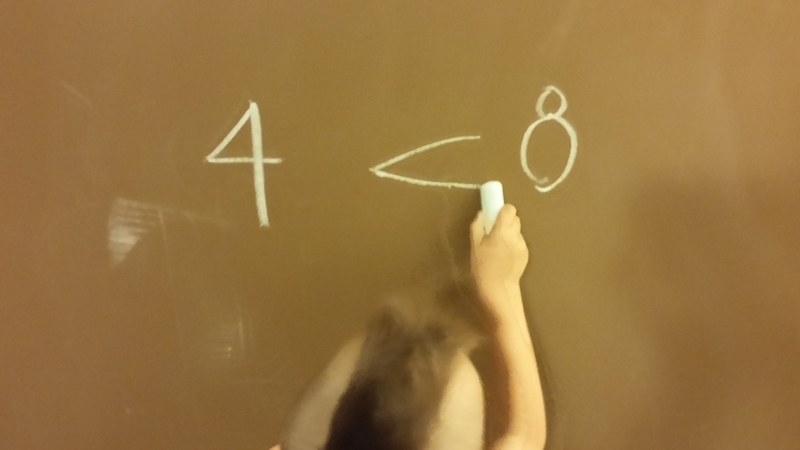 After that, we practiced dividing things into equal halves. In the story, the 12 little girls were in two straight lines, so I gave them a random even number of Lego blocks and asked them to put them into two equal halves. Maggie got frustrated with this pretty easily because she thought she shouldn’t be able to do this, but when she wasn’t trying so hard, she could do it very easily. 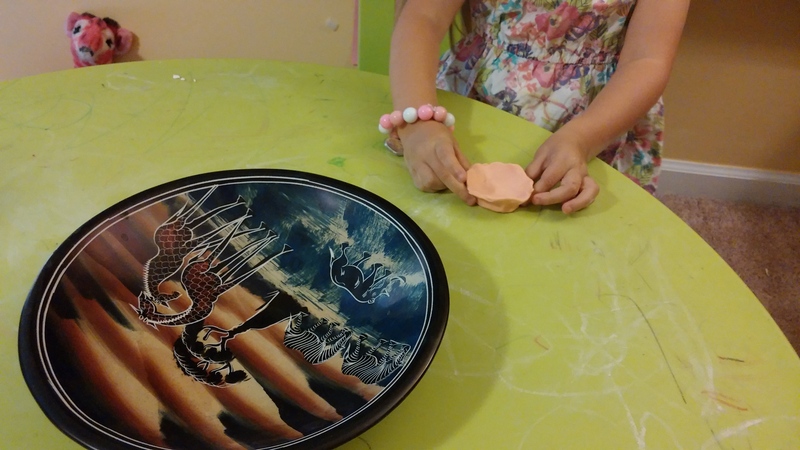 We practiced this with other objects throughout the day too. Day Three was all about Paris. We looked at tons of pictures of famous Paris landmarks like the Eiffel Tower, the Louvre and the Arc de Triomphe. We identified some of those in the book itself because many of the pages have those landmarks on them. We colored some French flags too. Maggie’s flag was a little small, but she said she didn’t want to make it big. 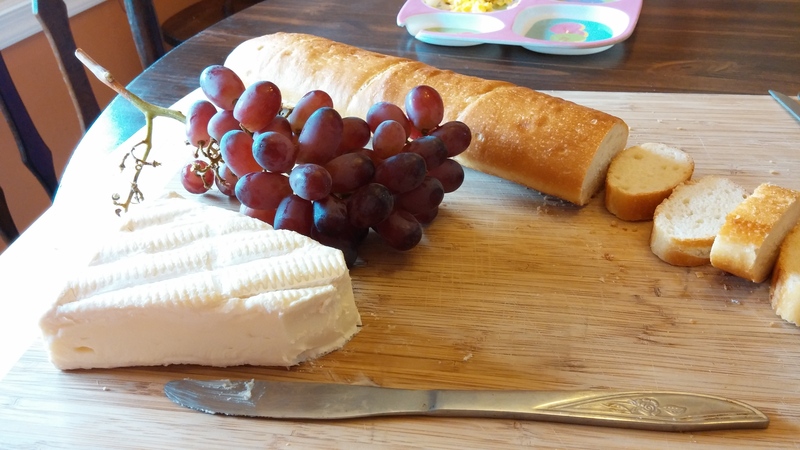 For lunch we had some good stinky French brie, grapes, a subpar grocery store baguette and some madeleines. We talked about how France has really important food traditions and are famous for pastries, cheese and wine. We learned some French food words. I wish I had found some good macarons. 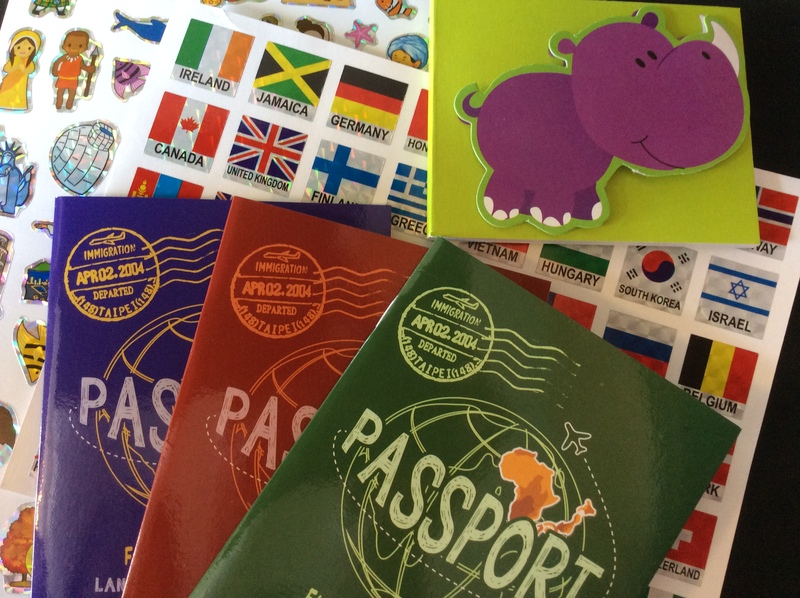 I had gotten these sticker passports at the dollar store, so I let them put the stickers on the pages in their passports and we talked about traveling. 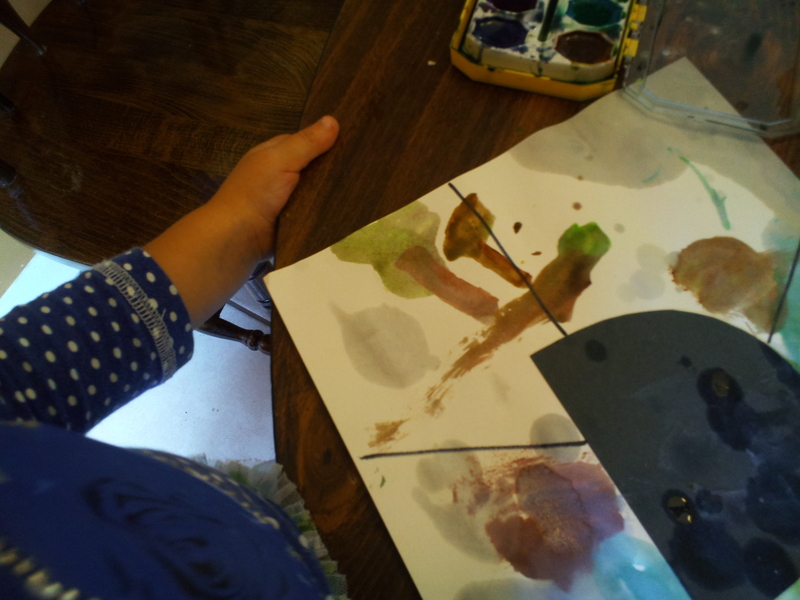 Day Four, we did some monochromatic painting like the illustrations in the book. 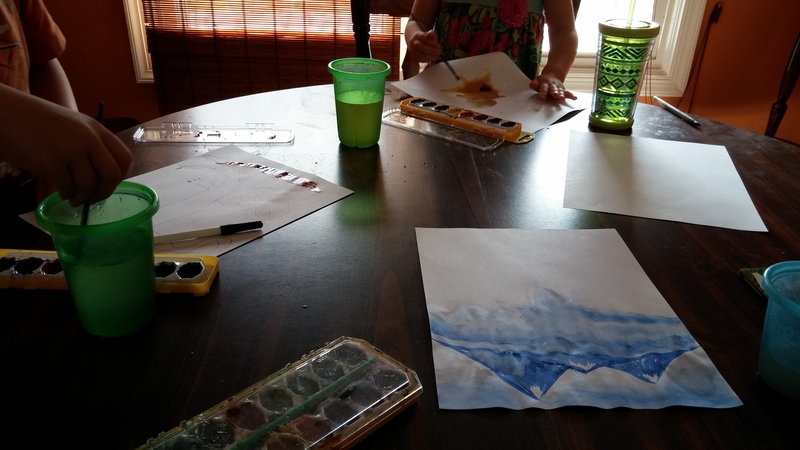 I only had a little bit of time on this day, so we didn’t do anything besides this, but the kids really liked learning about watercolors and how to change the shade of color by changing the amount of water. On the last day, we talked about compassion. What is it and what does it look like? 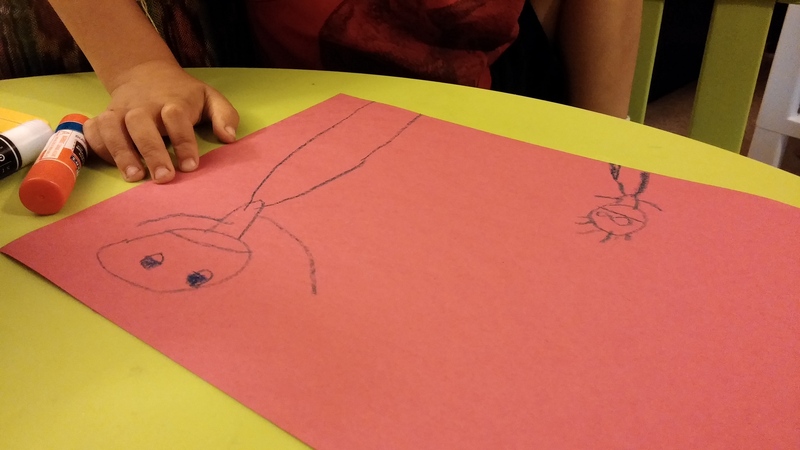 We wrote letters and drew pictures for some ladies in our church who had surgery or are very sick. 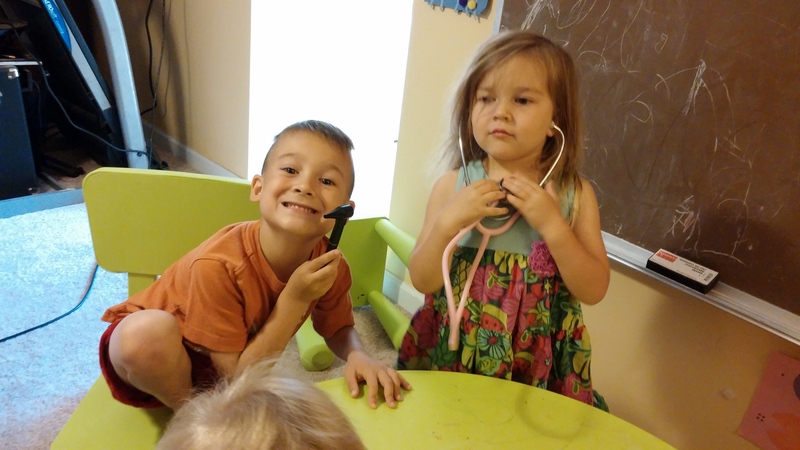 We talked about visiting people at the hospital and taking care of people who are sick or sad. We also talked about being sure we thank God that we are healthy like it says at the end of Madeline. 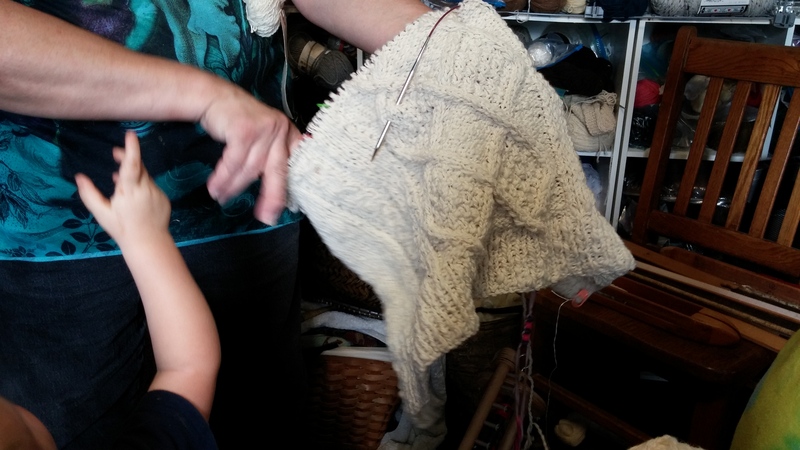 Next week is A New Coat for Anna by Harriet Ziefert. There has been quite a lot going on and I have a half a dozen blog posts bumping around in my brain, but nothing worth publishing just yet. 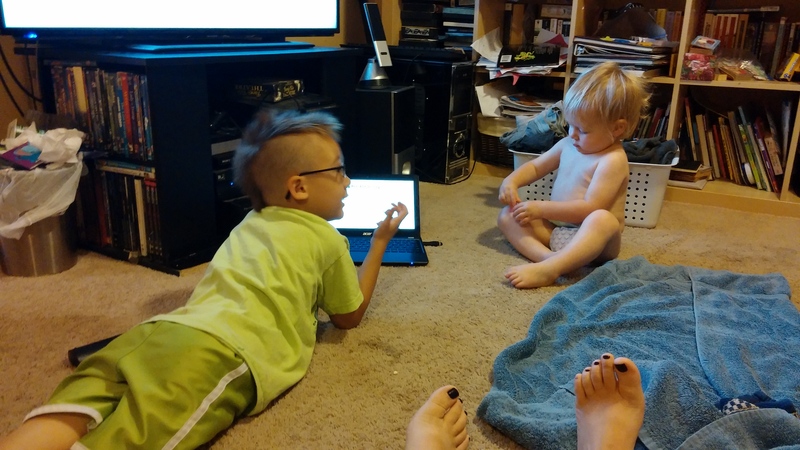 I actually wrote this post two weeks ago and haven’t been able to post it since, so this is our summer “school” summary for the week of June 8th to the 12th. Ready to read and learn! 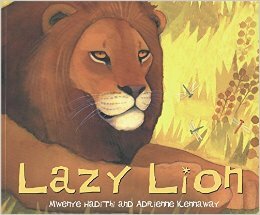 BUT it is officially summer in the Korn house and we have started our summer “school.” We took a week off after school ended to get used to a different schedule and then this week we started with <em>Lazy Lion</em> by Mwenye Hadithi. 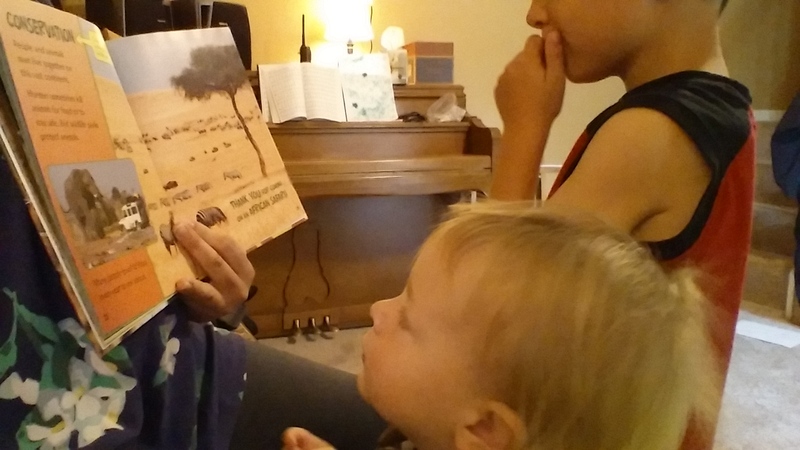 This was a book that my father in law had brought back for the kids from a missions trip in Africa and the kids really love it. It wasn’t part of my original plans for summer “school” but they requested it and I was happy to see them actively searching for books we can use for school. On Monday we started by talking about goals. What are goals and what will our goals for the summer be? 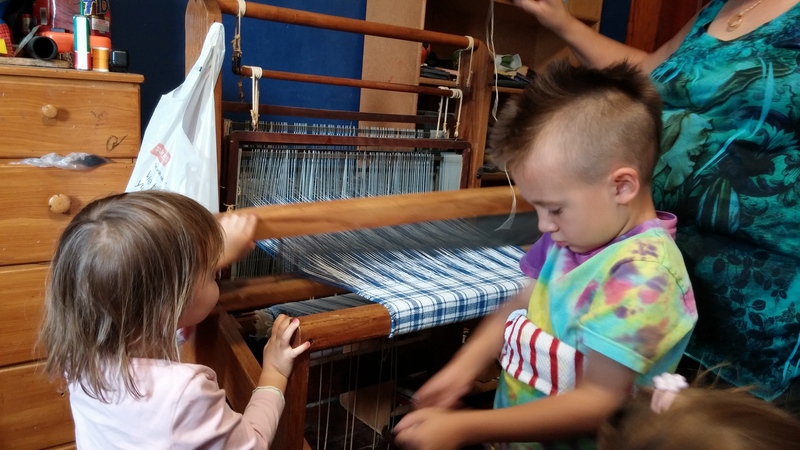 I felt much more equipped this summer after having the kids in actual school for a year, so I could determine what they can be expected to do and what things they need to concentrate on for next year because their teachers were so willing to help me out with that. Reading about various African animals. 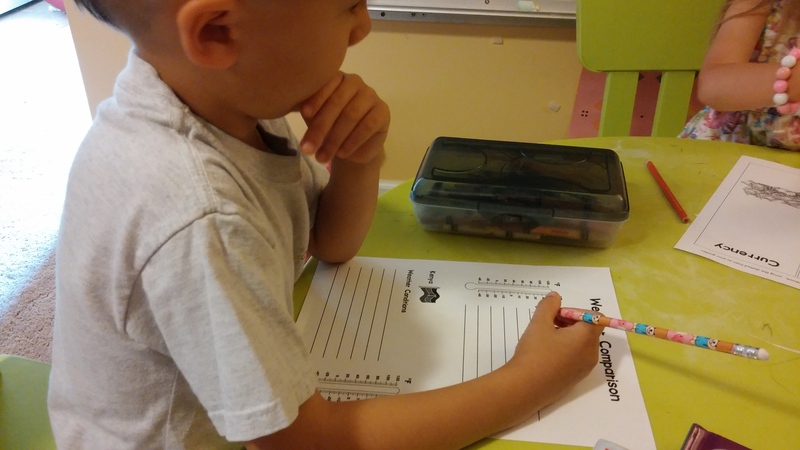 Bo’s goals as a upcoming first grader are to improve on reading skills (attacking difficult words, understanding what he’s reading and basic phonics skills) and writing skills (especially writing in lowercase). 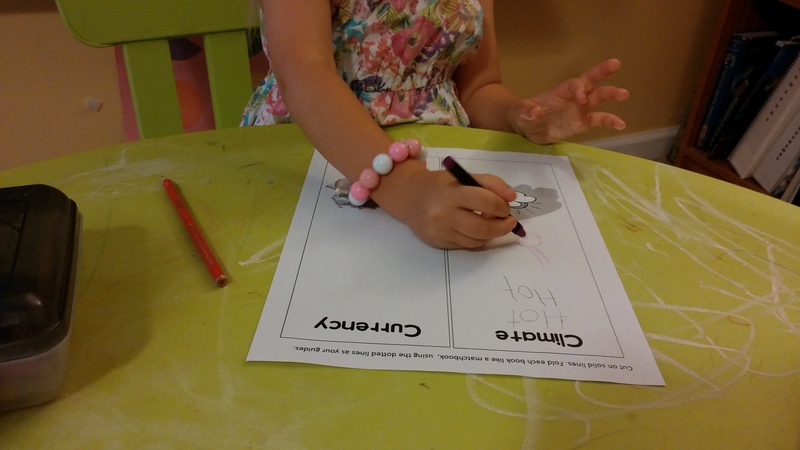 Maggie’s goals as a soon to be four-year-old are to work on writing letters and refine her fine motor skills. 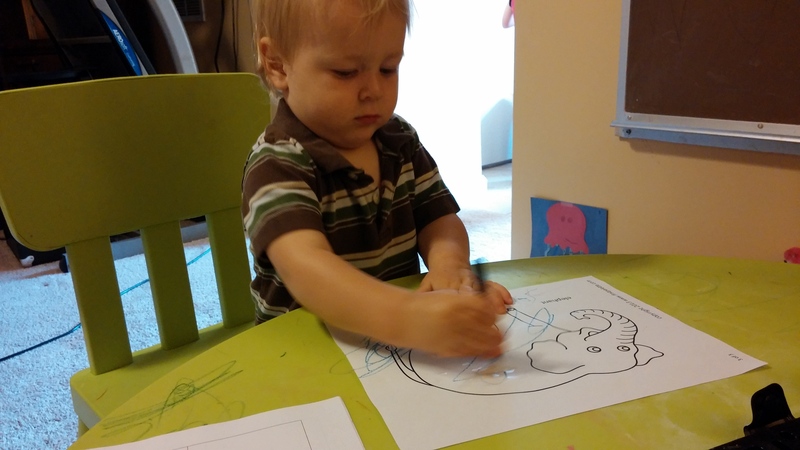 Joe (18 months) gets to have fun, be creative, learn to focus on a task and work on holding a writing utensil. 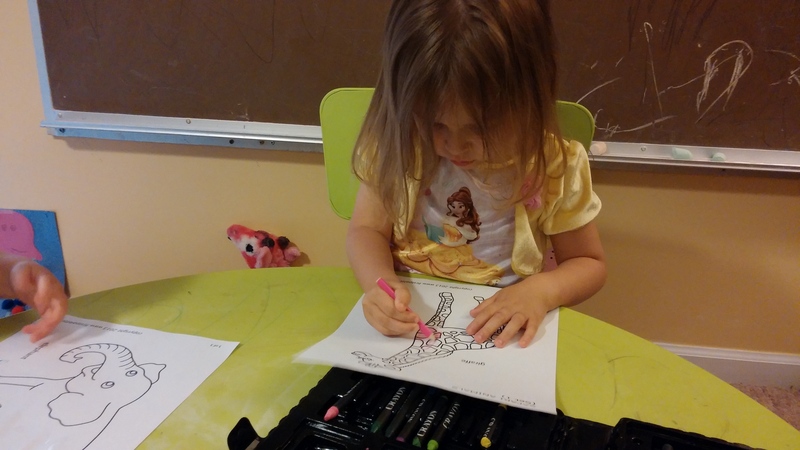 Maggie very intensely coloring her African animals. Monday’s topic was African animals. They brought their African stuffed animals to the school room with them. 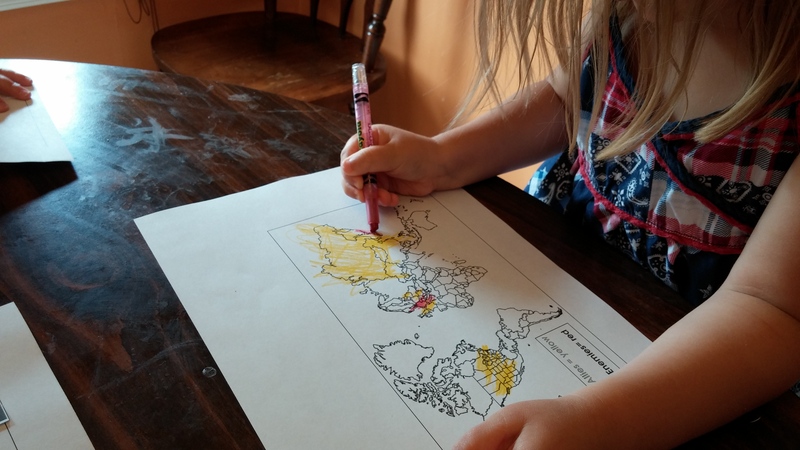 We used the Smithsonian’s Little Explorer series <em>African Animals</em> to look at the crazy diversity of animals in Africa. This was nice because it wasn’t just the big cats and grazers you see in most books about African animals. We also talked about reptiles and amphibians and talked about words like herbivores and scavengers. Made my biologist heart proud. 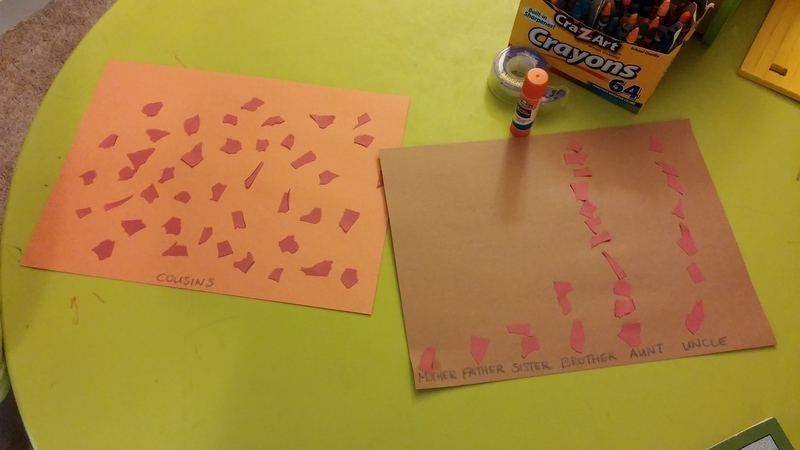 Maggie and Joe colored pages of African animals like cheetah, giraffe and baboons. 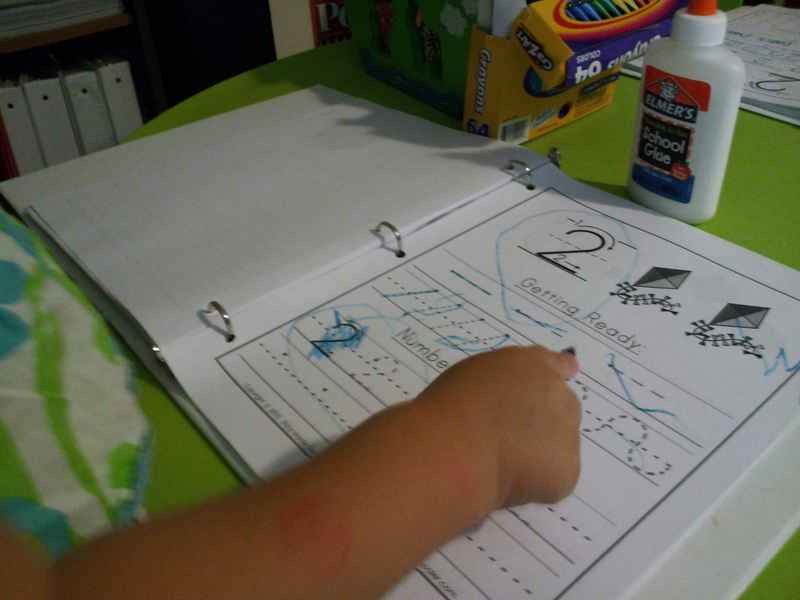 Bo practiced writing the names of a variety of animals to make a booklet. 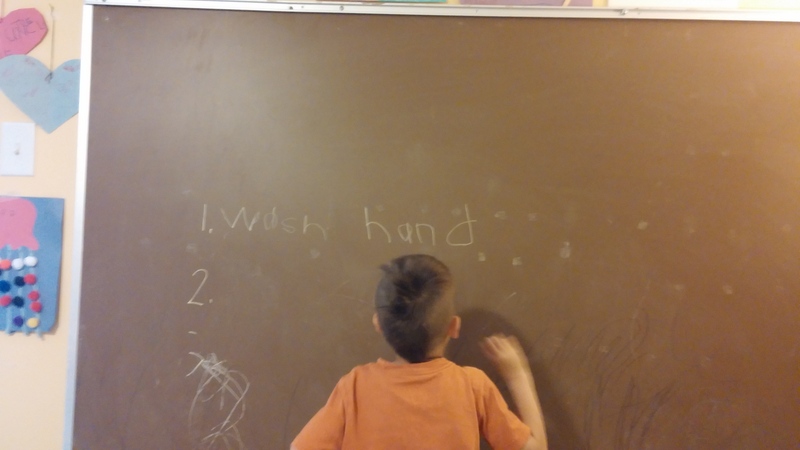 He got a little frustrated whenever I had to remind him to write in lowercase or if he wrote a letter backwards. 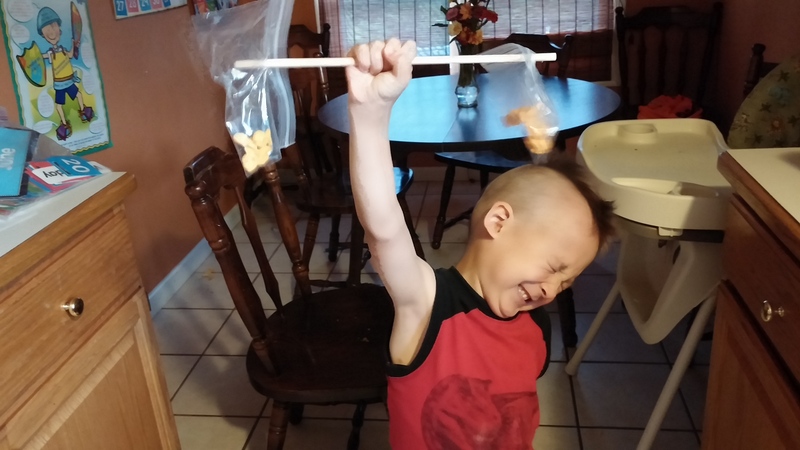 I will admit there were some tears, but he needs to work on pushing through that frustration. 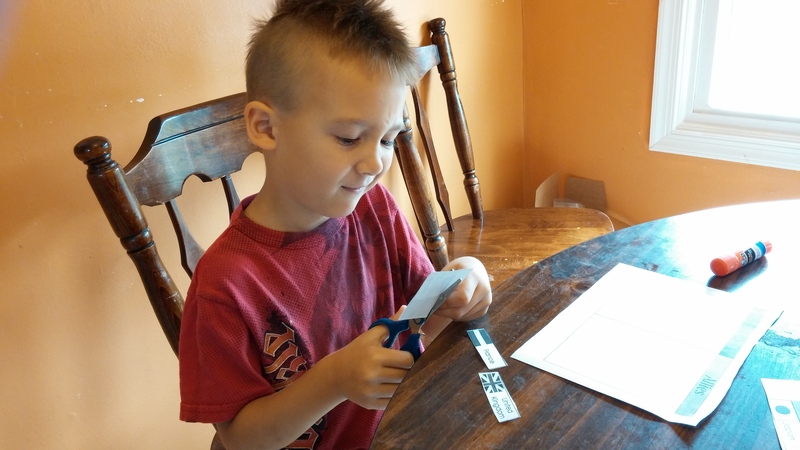 When he was done writing the names on the pages, he cut them out and then we worked on alphabetizing. 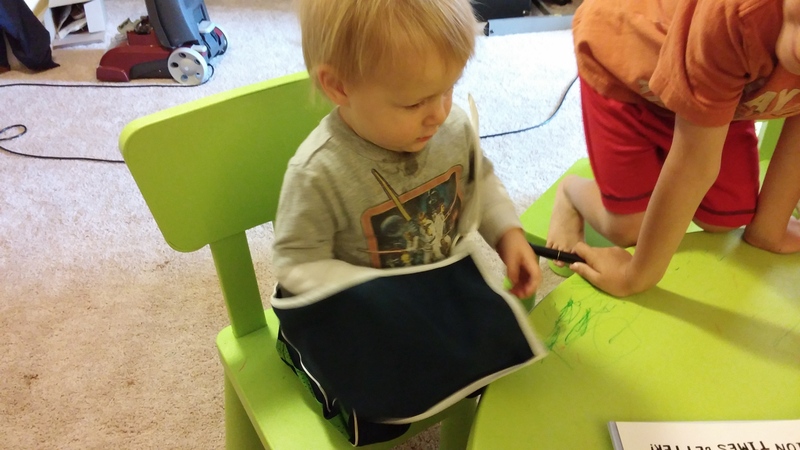 He really had a lot of fun with that because he loves putting things in their places. 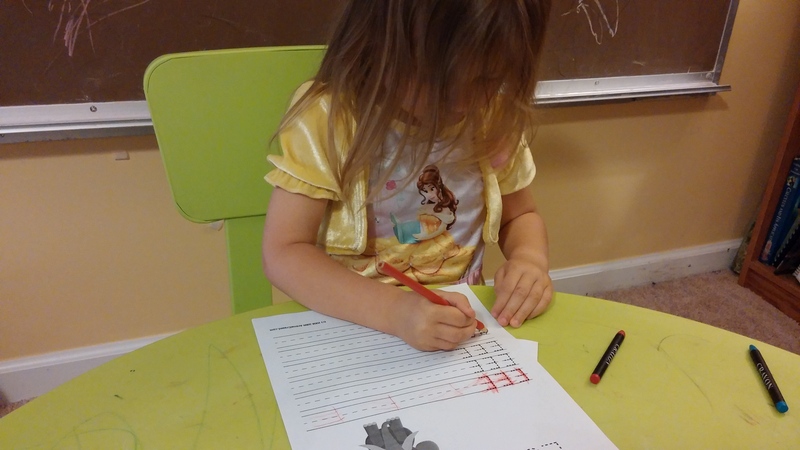 Meanwhile, Maggie worked on her E’s using a worksheet. We will work on this all week because she tends to give up on those E’s and it’s a letter in her name. 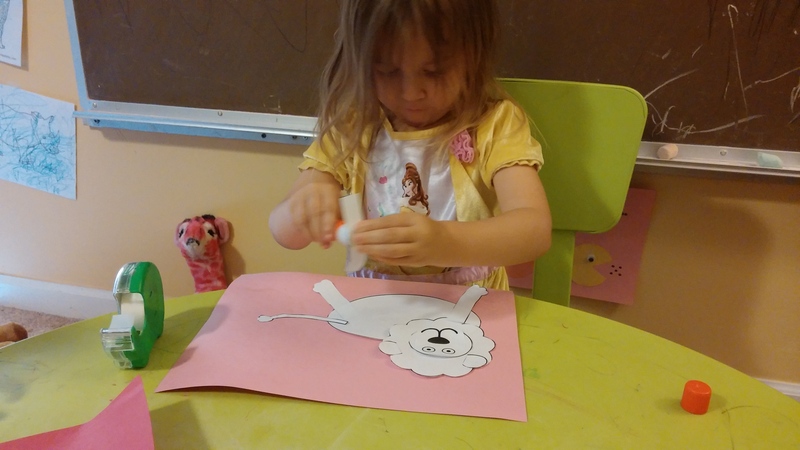 Finally, we used a template to put together a lion and a cheetah craft. I wasn’t super particular about them putting it together as instructed and the kids had fun figuring out where the parts all went. I think their favorite part was hanging all of their work on the wall – even Joe enjoyed showing off his handiwork. We finished the day by watching <em>The Lion King</em> before lunch and talking about how different the animals and trees in the movie are compared to home. Because I decided to be less uptight about fitting school into our busy schedule this summer, we skipped school on Tuesday. (If the point is to give them something to do during they day, I shouldn’t be worried they are missing school to do something else, right?) 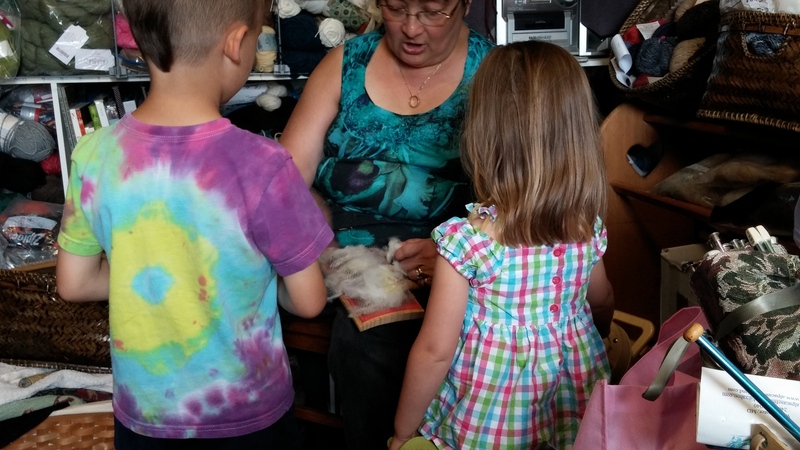 So they spent Tuesday with their Nana picking strawberries and running errands. 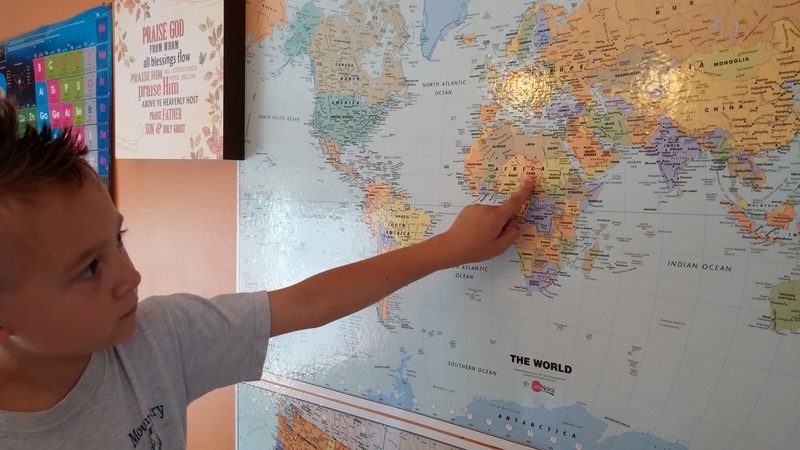 Wednesday morning was spent at the lake, but when we came back, we learned all about Kenya. I’m not sure why I chose Kenya of all the countries in Africa but it was a lot of fun. We looked at photos in some library books of the country and the people there. We talked about how they are different and how they are the same as us. That led into a discussion on climate differences. Bo wrote sentences describing weather where we live with the weather in Kenya. 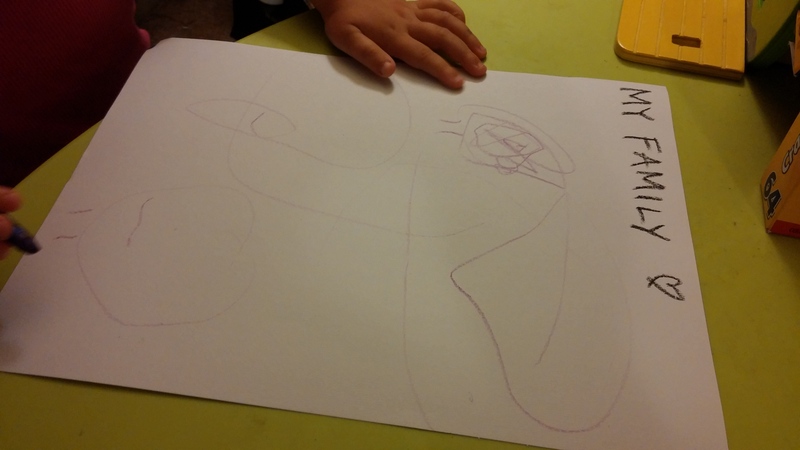 Maggie wrote the word “hot” and drew a picture to go with it. 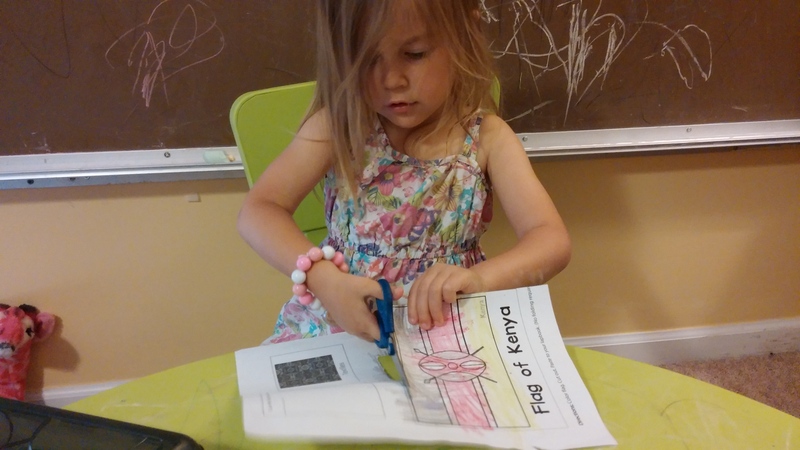 Maggie colored the flag while Bo labeled and colored a map of Kenya. 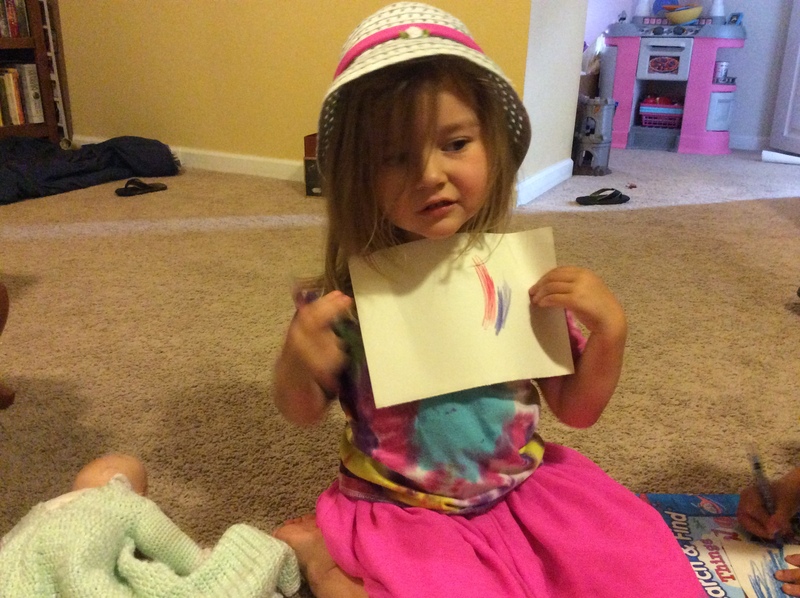 Maggie practiced her scissor-ing skills and cut out her flag to hang up. 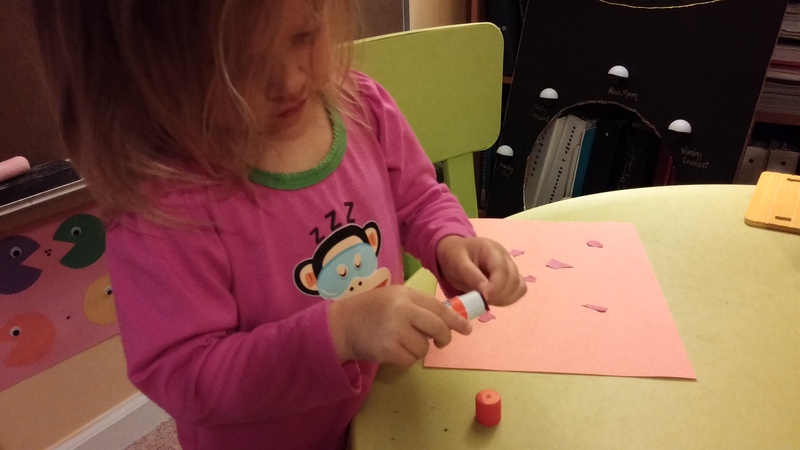 I was pretty impressed with her concentration while she was cutting. We talked about a few things like currency, religion and language. Before we watched the movie, though, we looked at a pottery bowl that someone had brought back for us from Africa. 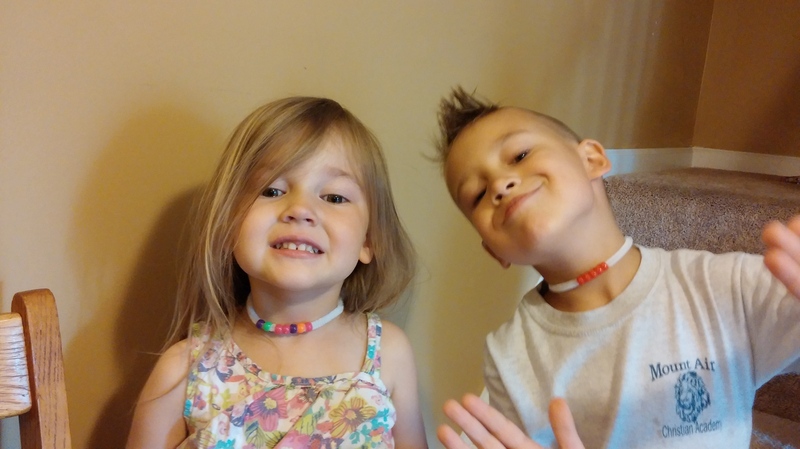 We made our own bowls out of clay and then made some beaded necklaces to practice our fine motor skills. 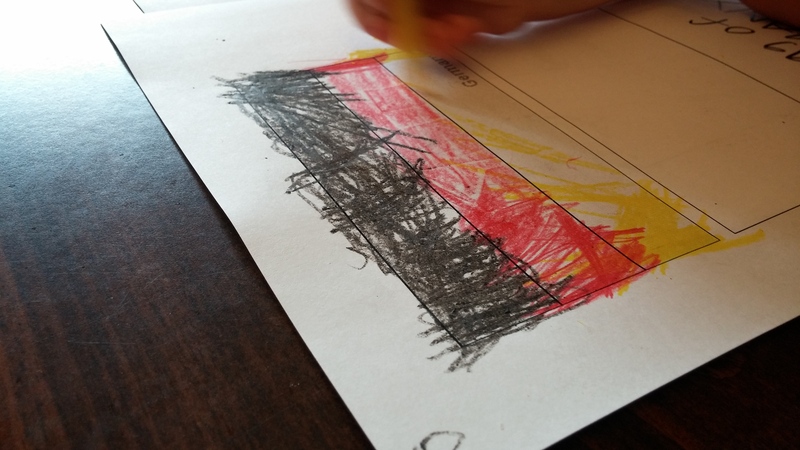 In church on Sunday, the kids even recognized and pointed out to me the Kenyan flag. Thursday we went to the lake and had a blast. But Bo asked me why we weren’t having school. Yikes. He even started suggesting times when we could have done school in the day. What? 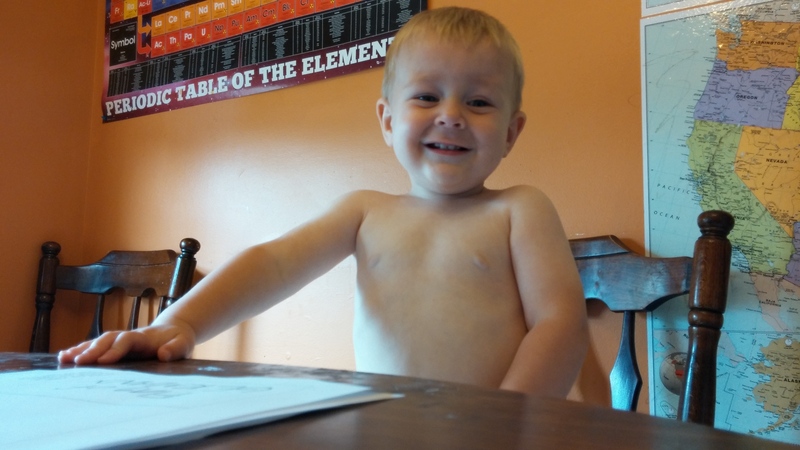 You don’t do school in diapers? We ended the day by doing a summary sheet for the week. Bo wrote about what he learned this week and Maggie drew a picture of what she learned this week. The really interesting part was the discussion that occurred between the two of them about it. There was so much more we could have done. I planned lessons on engineering (because the book is about a lion trying to get other animals to build him a house) and missions. 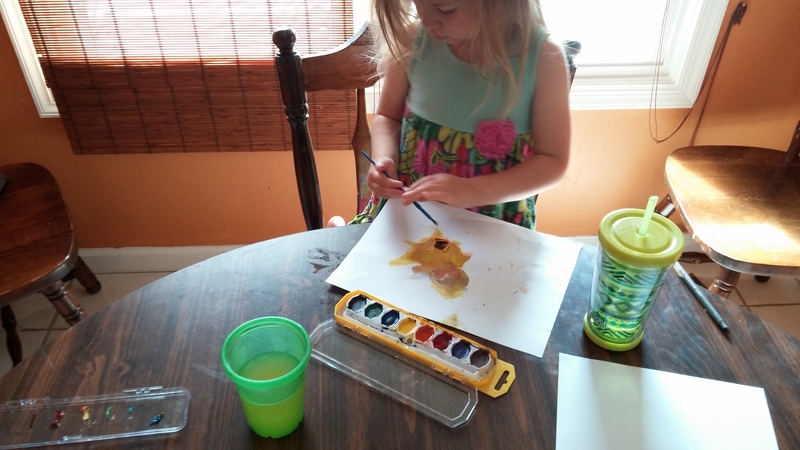 We easily could have done an art lesson on watercolors or landscapes. There was a lot more we could have done. 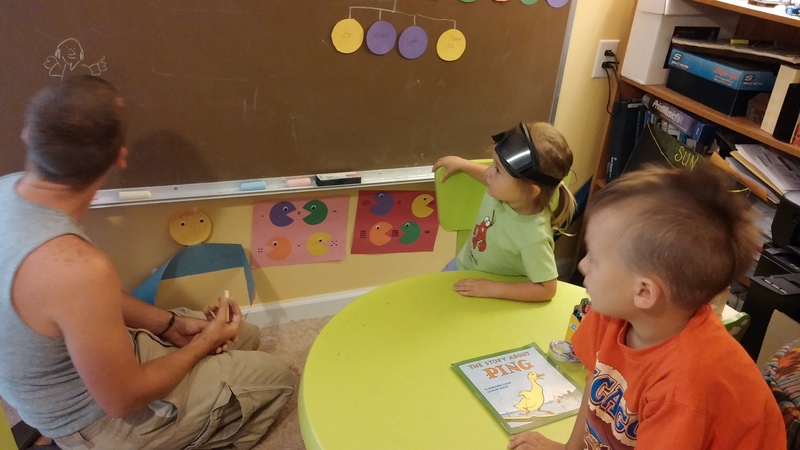 After taking a break for vacation Bible school, it was nice to be back to our schedule. The kids were extra excited about it and spent Monday morning reorganizing the basement school room so we could get started right away. 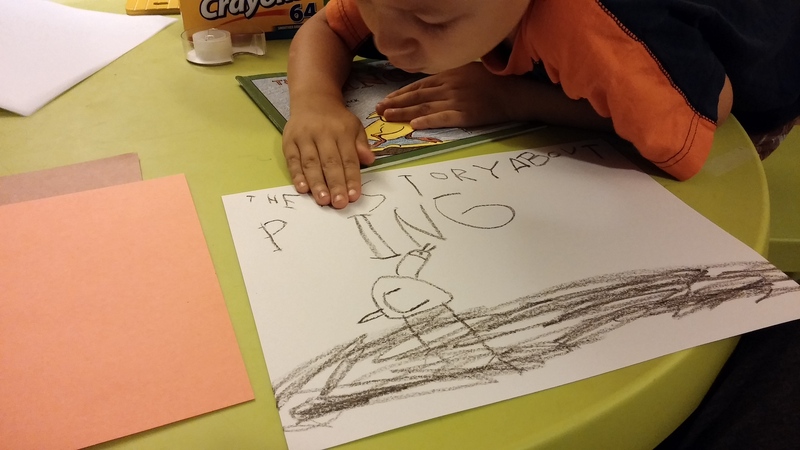 I chose to do the book “The Story About Ping,” which is about a duck on the Yangtze river who gets into trouble after he hides to avoid punishment for being the last duck on the boat. This book was written by Marjorie Flack and Kurt Wiese in 1933, but it’s a classic. Bo is covering the S he accidentally drew backwards. 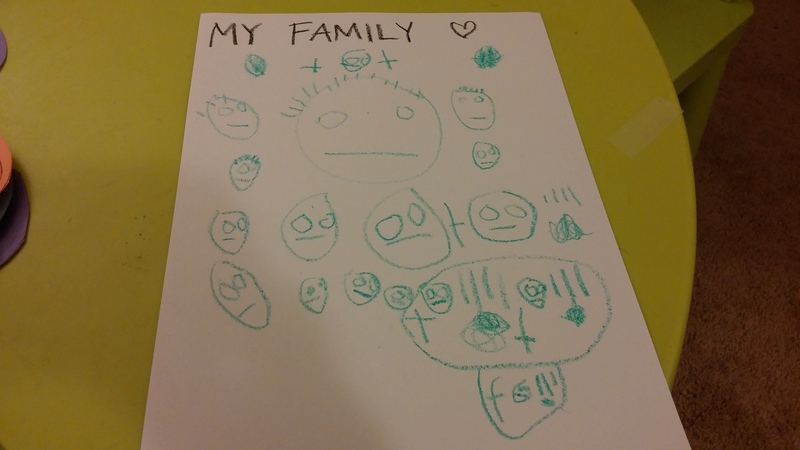 We started the week by talking about family. 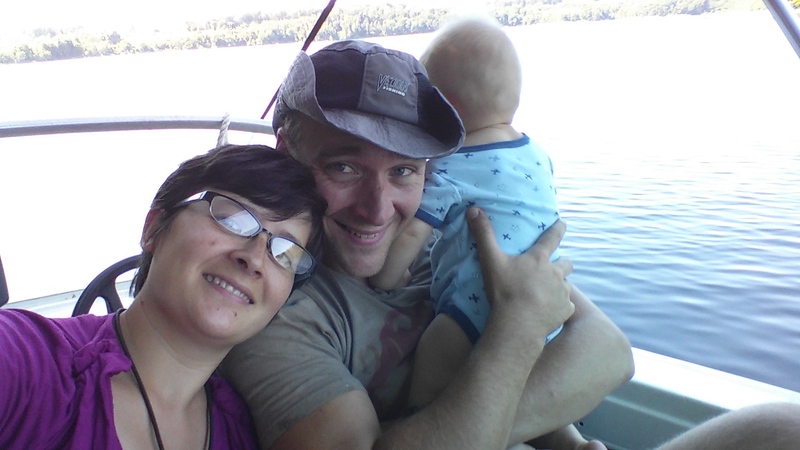 Ping lives on the boat with a very large extended family, so we started by talking about what family really means. We discussed adoption and marriage and talked about how people don’t have to be related to you to be family. Maggie's picture included baby Joe and mommy. 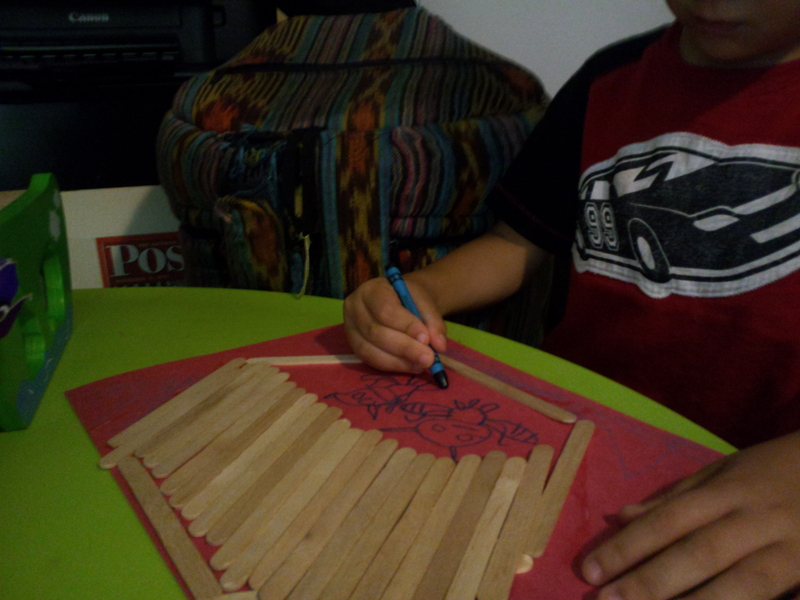 Bo drew crosses to show the family members that have died. Both of them started by drawing Baby Joe, which I thought was really cute. Then Bo said his paper wasn’t big enough and he insisted he had no room for bodies – just heads. Then he drew my brother Joe and my uncle Joe (who he calls his Gruncle Joe). He kept adding heads and then when he drew anyone who has died, he drew a cross next to them. 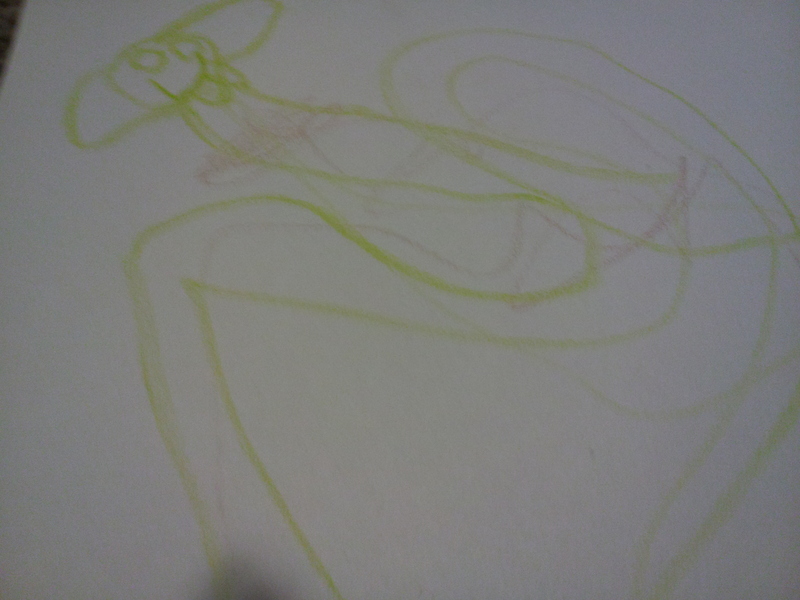 Maggie’s drawings are starting to take form, which is fun to watch. She loves to draw and she takes great pride in her art. 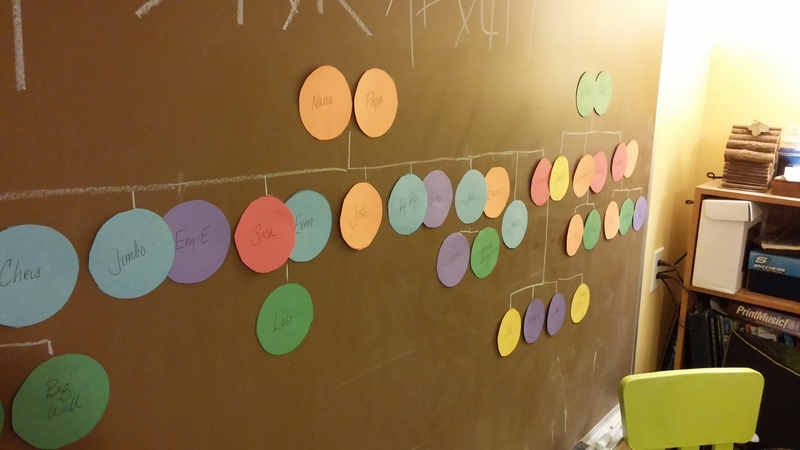 After they finished their drawings, we constructed a family tree/pedigree of our family. We started with my parents and Patrick’s parents, and did all of our siblings and nieces and nephews. Since my family is so large, we had to keep it limited to those three generations. Our chalkboard would only hold that much and I had to keep moving Patrick’s side of the family over to make room for mine. I would zoom in more but there are some secret baby names on there. Bo really loved trying to remember who everyone was and what their children’s names were. It reminded me very much of my grandmother Oa who really values family trees. 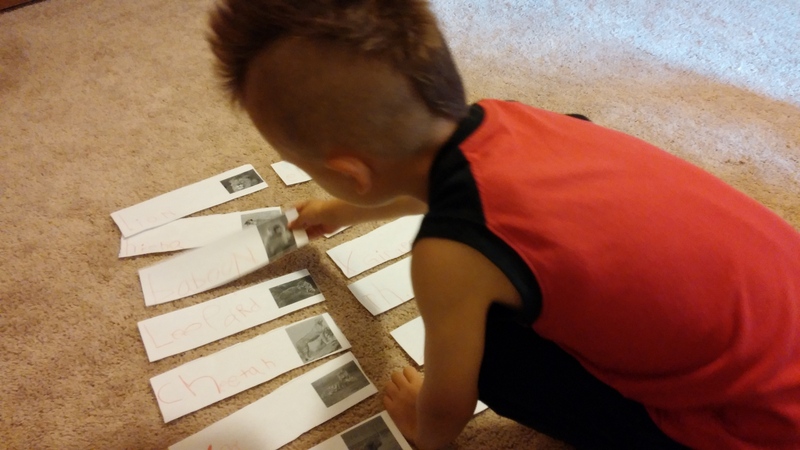 We reviewed family relationships and saw them visually on the family tree. We counted all the aunts, uncles and cousins on our tree. Finally, we ended by thanking God for family. Maggie said, “Dear God, thank you for my family because I love it.” And Bo said, “Dear God, thank you for making my family. I think you did a beautiful job.” So sweet. On Tuesday, we reviewed the letter P. Maggie did her prewriting page and is doing so much better working independently on these. 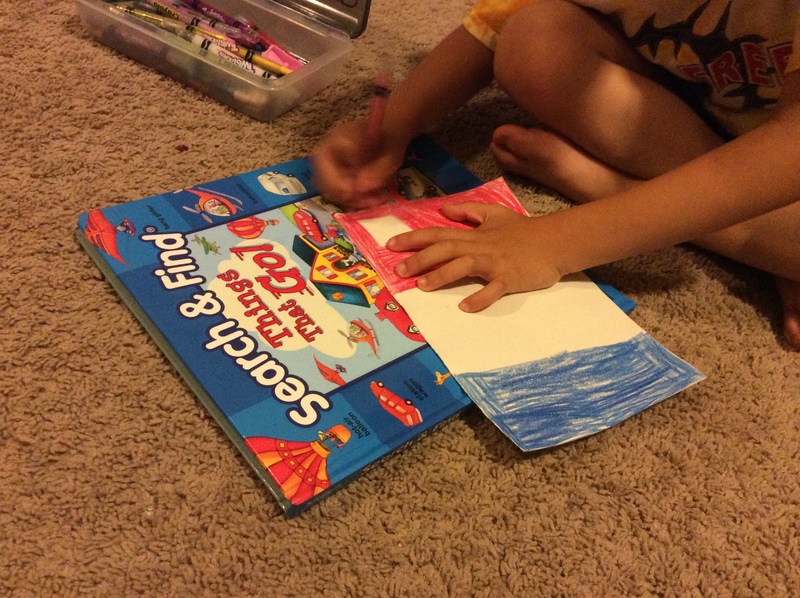 I had Bo try to draw the cover of the book and copy the title. He really liked that and even tried to make his letters fancy like they are on the book. Then we reread the paragraph that counted Ping’s family members and we glued little pieces of paper to a chart to count them. I set Maggie on tearing up and then gluing 42 pieces of paper for his 42 cousins and Bo worked on the rest of the family. They loved using glue. On Wednesday, Patrick taught them all about Jonah from the Bible. He narrated and drew pictures on the board. Bo was so intent and interested. He kept asking questions and predicting what was happening next. Maggie thought the goggles looked great with her outfit. Bo really loves whales, so we drew whales with Jonah in the belly. 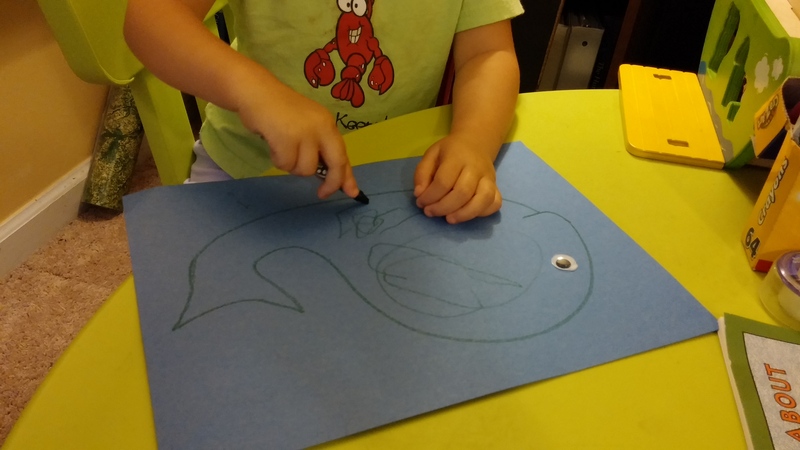 We also discussed how it could be a fish or a whale – that the Bible says fish but they didn’t differentiate between fish and whales when it was written. Maggie wanted help drawing the whale, but then drew all kinds of things in the whale, including me. Thursday was all about China. We used some YouTube videos to learn to count to ten in Mandarin. We looked at photos of the Great Wall, dragons and the Yangtze River which figures prominently in the story. 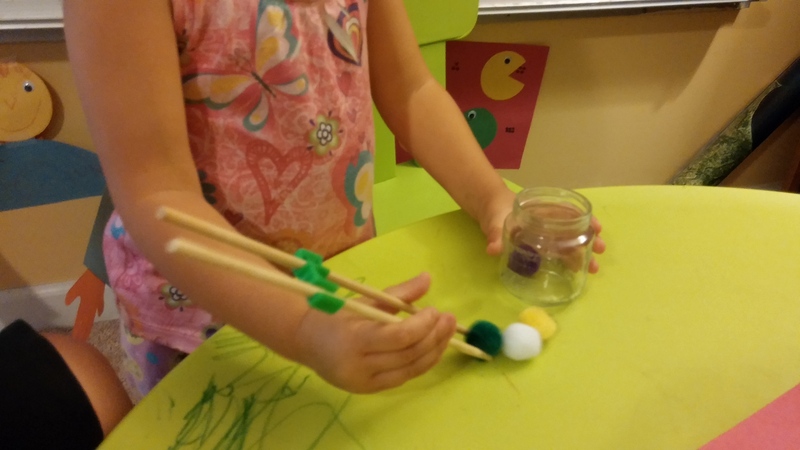 We practiced using chopsticks with trainers. I tried to teach them without the trainers, but they got very frustrated. 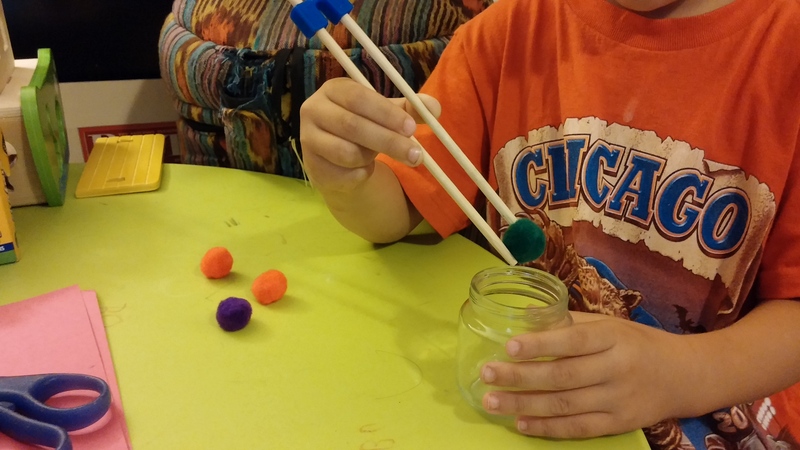 Then we used them to put some pompoms in a baby food jar. 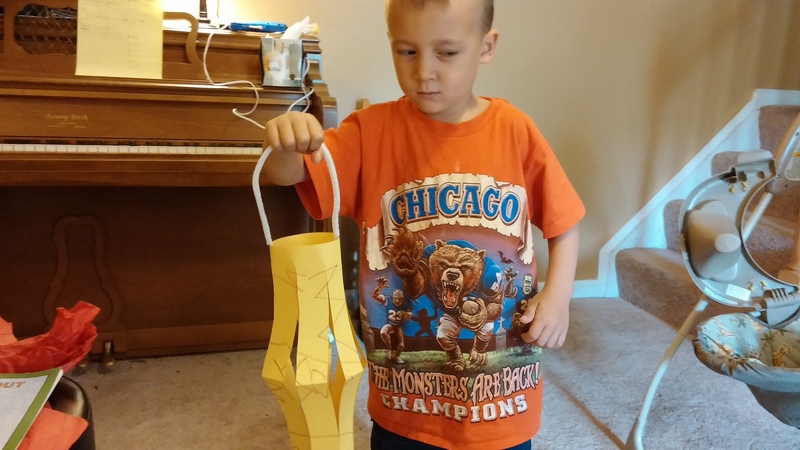 Then we made pretty simple paper lanterns so they could have some practice with using scissors. 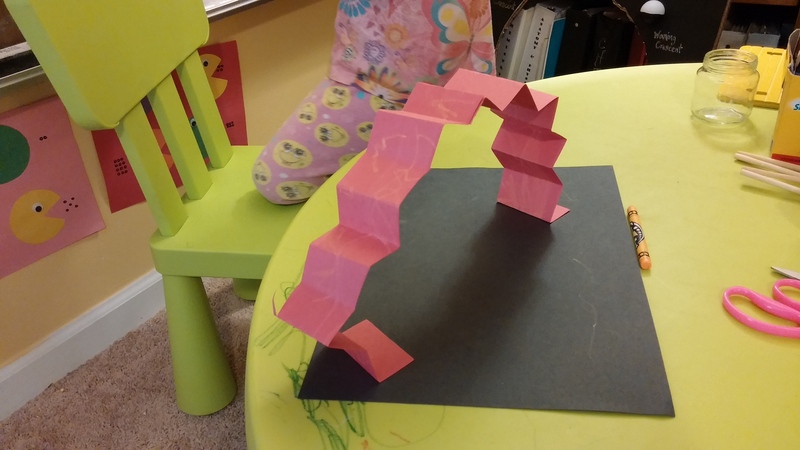 They were easy: fold a piece of paper in half, cut some straight lines starting at the fold and ending about an inch from the edge, unfold and roll up. My super dramatic son pretending his needs his lantern to see in the dark. Bo was really disappointed we didn’t do more with dragons, so we made dragons with paper bodies that come off the paper for some 3D flavor. Maggie was happy with just this but Bo wanted more. 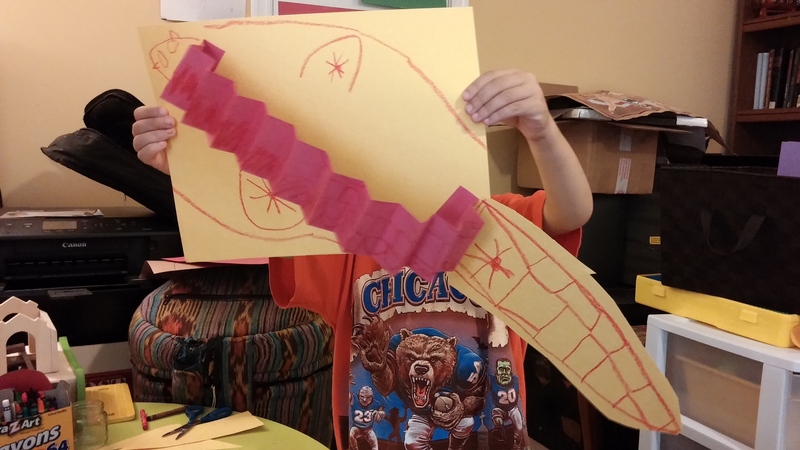 Bo added a tail and a head and wings. 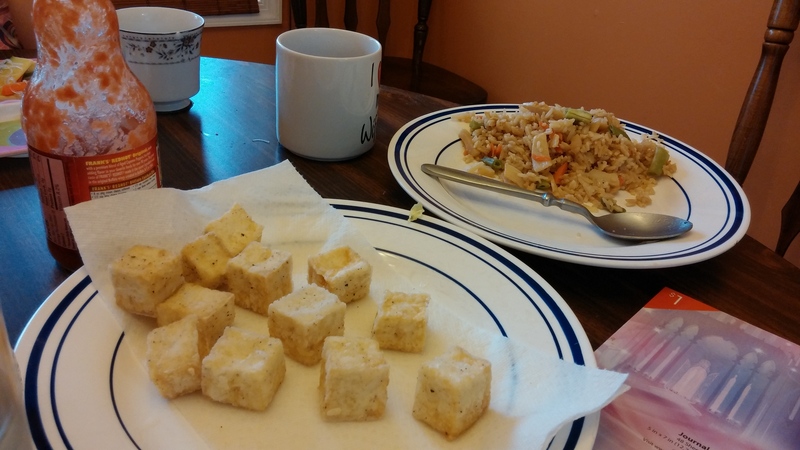 The last thing we did was make a great feast of fried rice, spring rolls, fried tofu and fortune cookies. 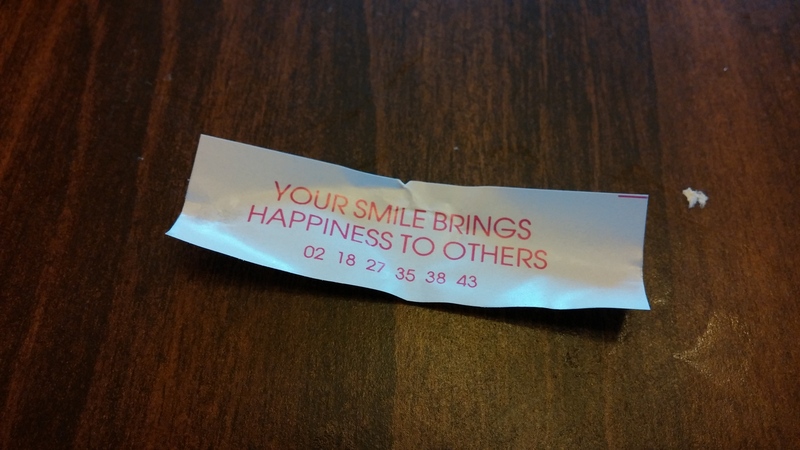 Maggie's fortune is actually true!! 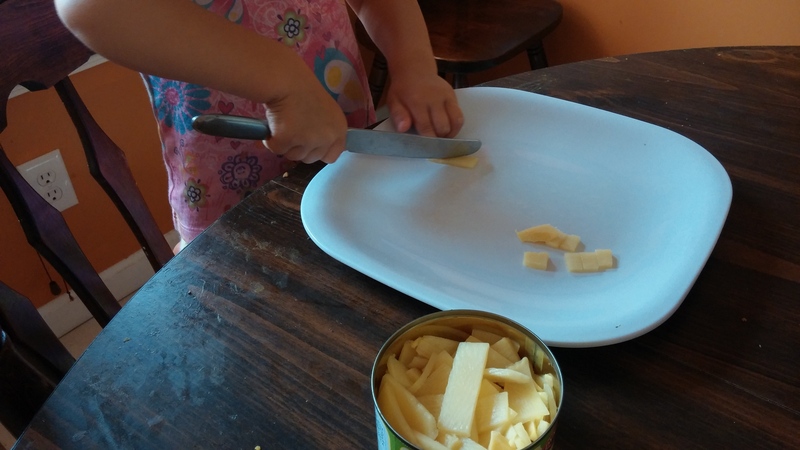 The kids helped me cut up water chestnuts and bamboo shoots for the fried rice. 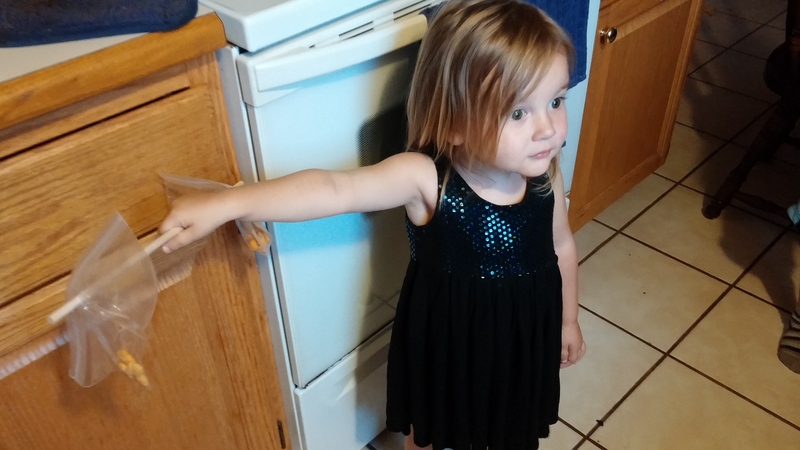 And they really loved stealing veggies while I cooked. Maggie loves cucumbers and napa cabbage. And Bo was super excited about the tofu. Oh and the green tea with honey was a hit. 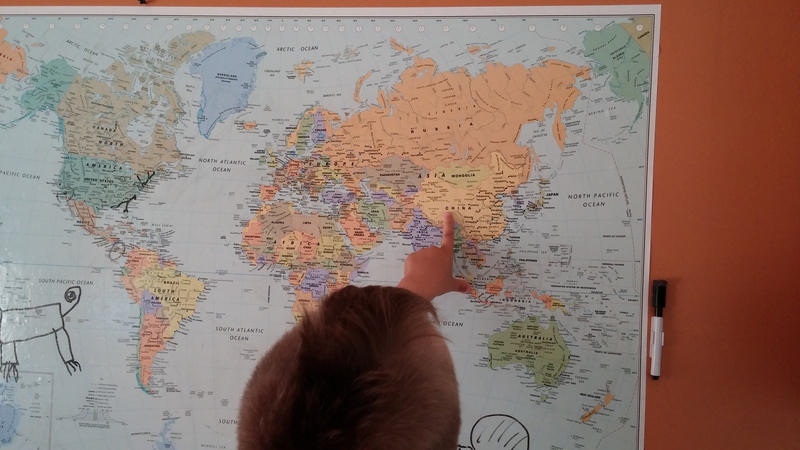 We also found China on the world map. The kids were so excited and kept saying it was the longest day of school ever. Friday was our last day with Ping. We made it a water day. We discussed how ducks don’t get wet because they spread oil on their feathers. 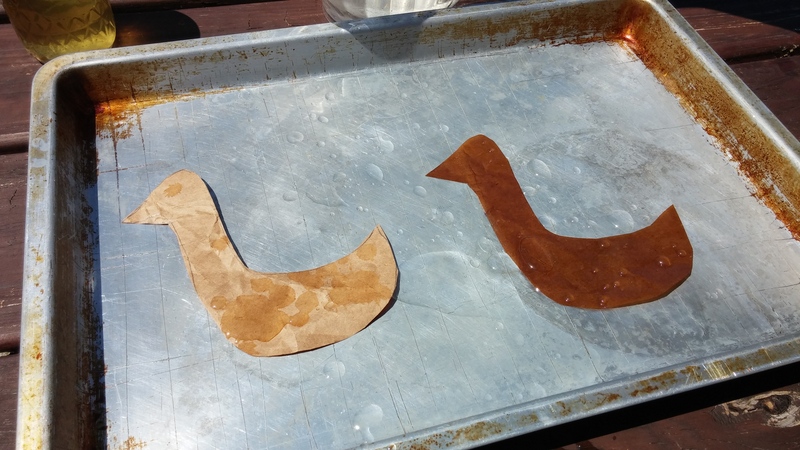 To illustrate this, we cut duck shapes out of a paper bag and coated one with vegetable oil. Then we sprinkled water on both. The water on the oiled duck beaded up and it soaked into the other duck. 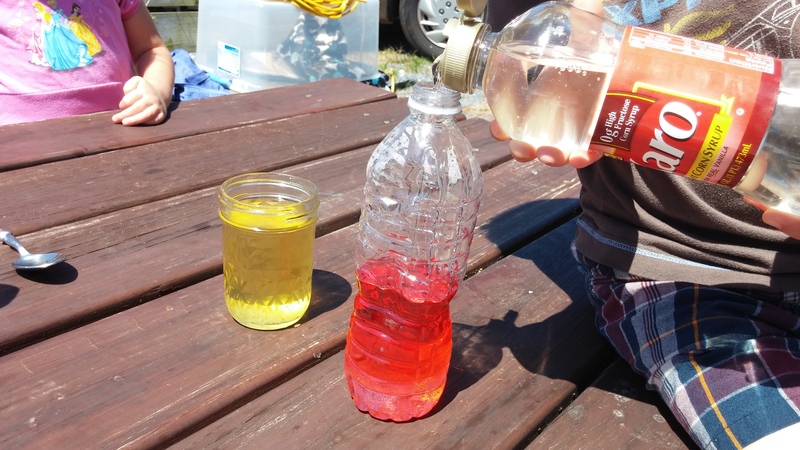 Then we filled a bottle with three different liquids. We tested each of the three liquids first and tried to predict which one was the heaviest and would be on the bottom. The decided corn syrup would be on the bottom. 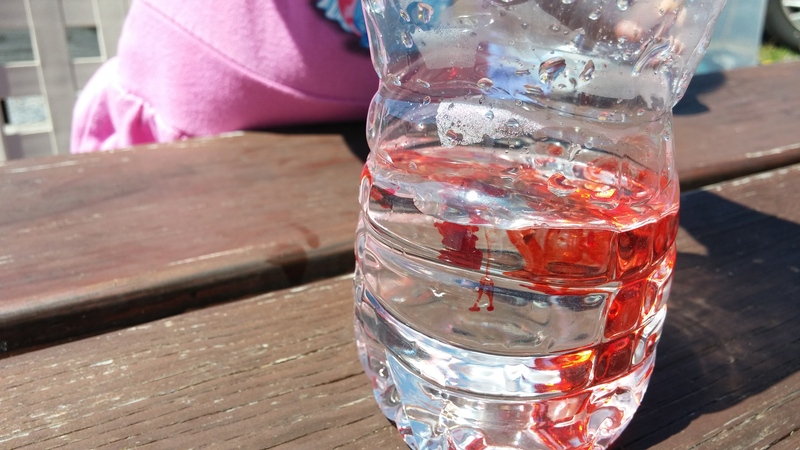 We added red food coloring to the water for fun. The corn syrup and water mixed, so our final bottle only had two layers, which was disappointing. But the kids like to shake the bottle up. 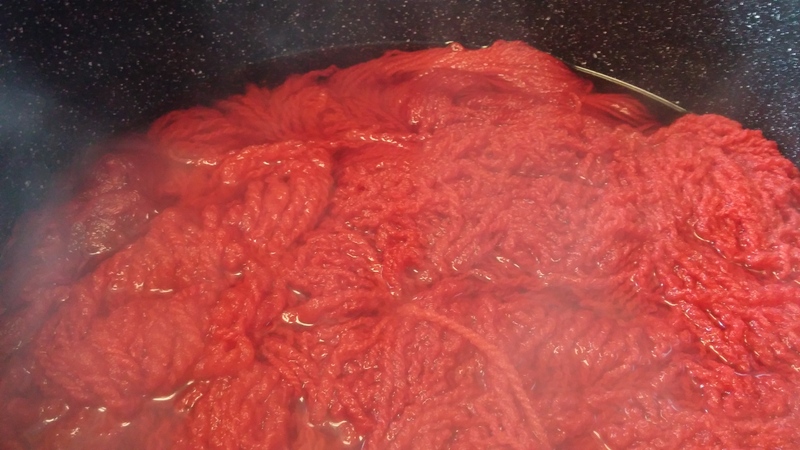 I asked them to predict what would happen if we let it sit after shaking it up and Bo said he thought it would separate into the layers again. 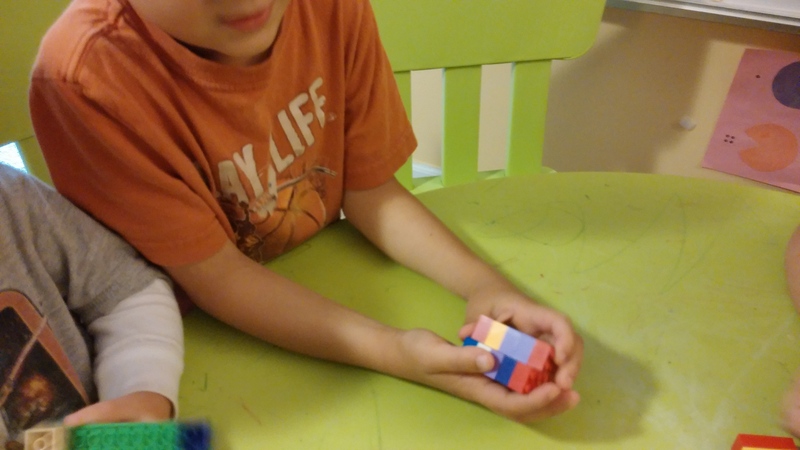 He watched intently until it stated to happen and was so excited when he was right. 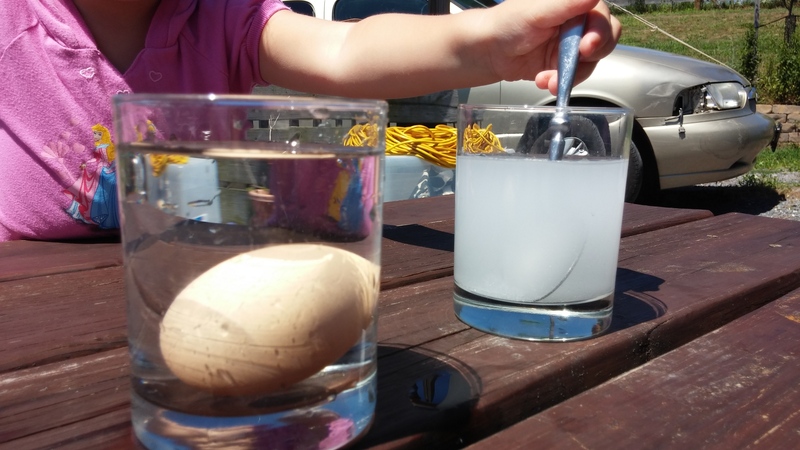 My kids already knew that eggs sink, so I asked them what we could do to make them float. We discussed density and and I suggested we add salt to the water to change its density. 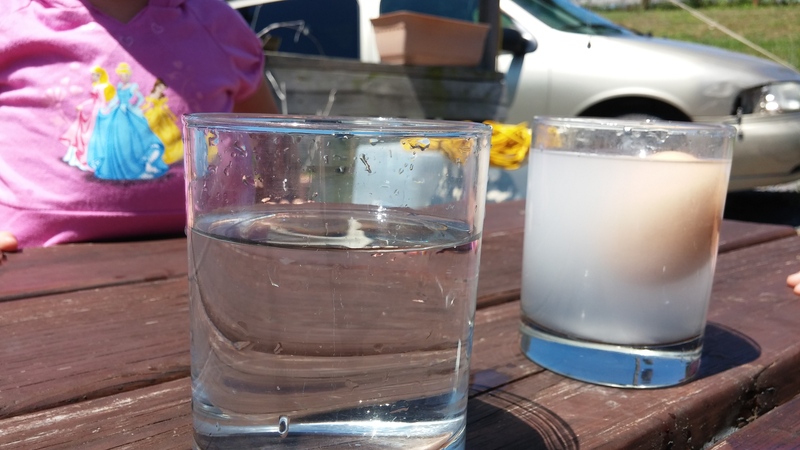 They were amazed when the egg floated in the salt water. We also related this back to the beach and the salt water there. 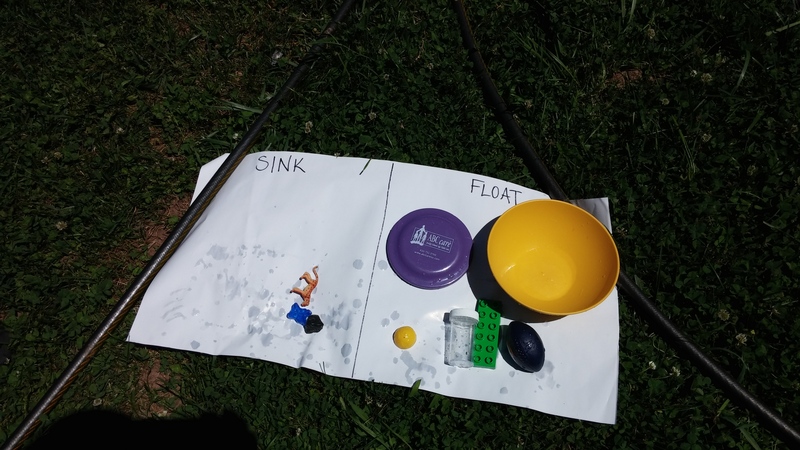 Then we wanted to test a set of other objects too see if they floated or sank. We predicted what would happen before each object and then placed them on a sheet according to their results. Bo kept suggesting further tests. 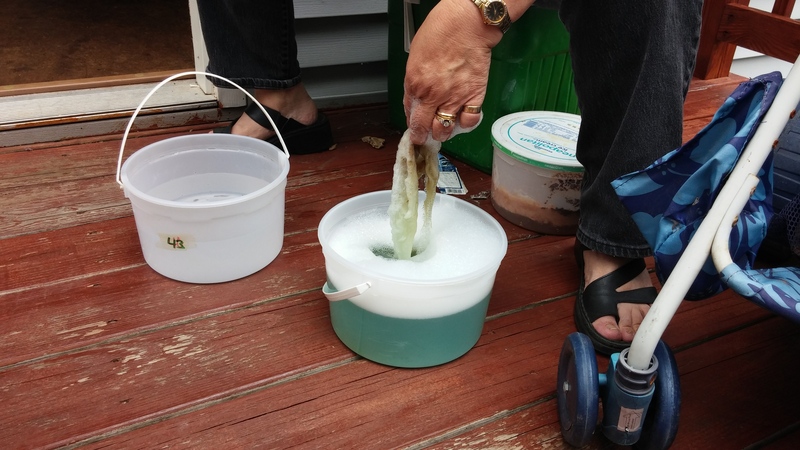 What happens when we fill the objects with water? 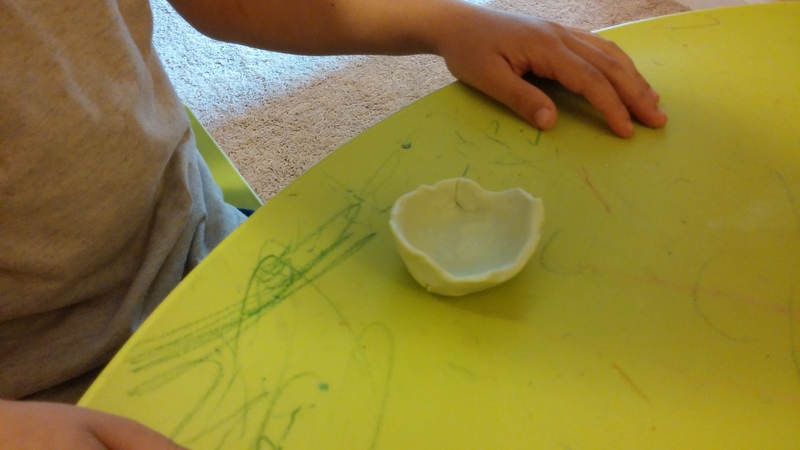 What if we put all the objects in the bowl – will it still float? Love that scientific brain. 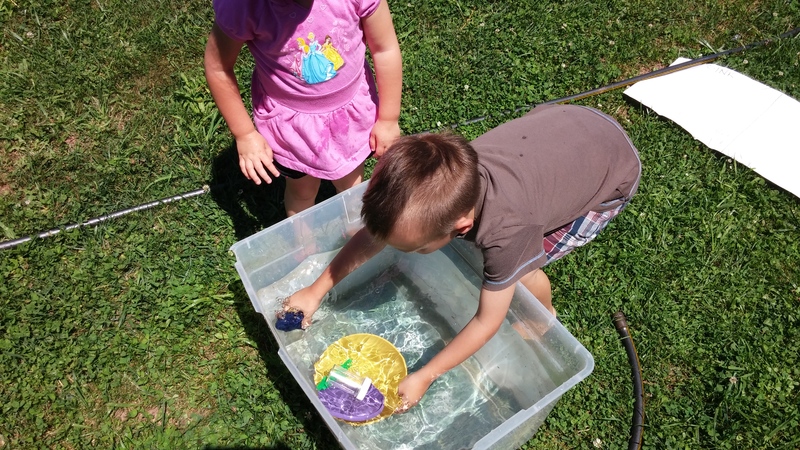 Maggie was still better at predicting if an object will float though. 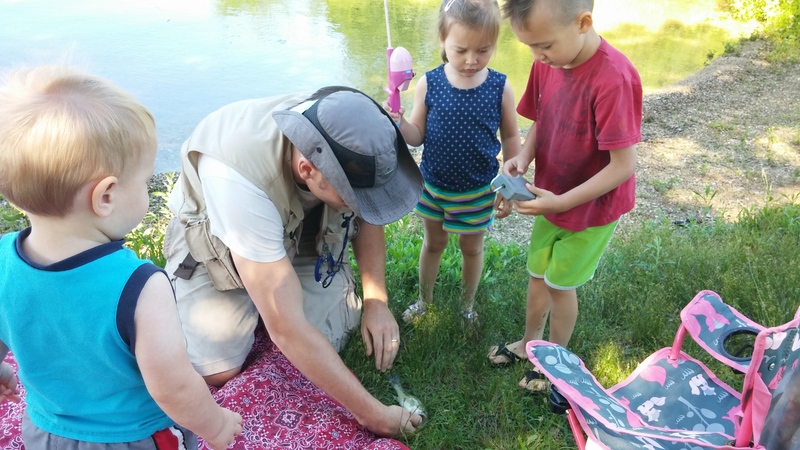 We ended the week by going out on the boat with the whole family and selling out some water birds to observe. We saw ducks, geese, one cormorant and one great blue heron. It was a beautiful afternoon and we had a great time chasing birds. 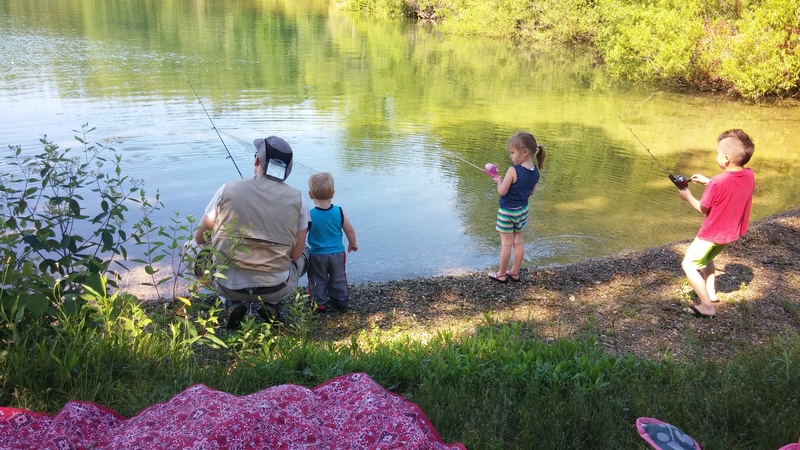 Daddy is never happier than when his whole family is on the boat with him and a line is in the water. This was the story I wanted to do last week with the Fourth of July, but it worked out better to do Blueberries for Sal instead. Fireboat by Maira Kalman is about the real life fireboat called the John J. Harvey from New York City. Built in the 1930’s and retired in the 90’s, the Harvey came out of retirement on 9/11 to help fight fires and save lives. 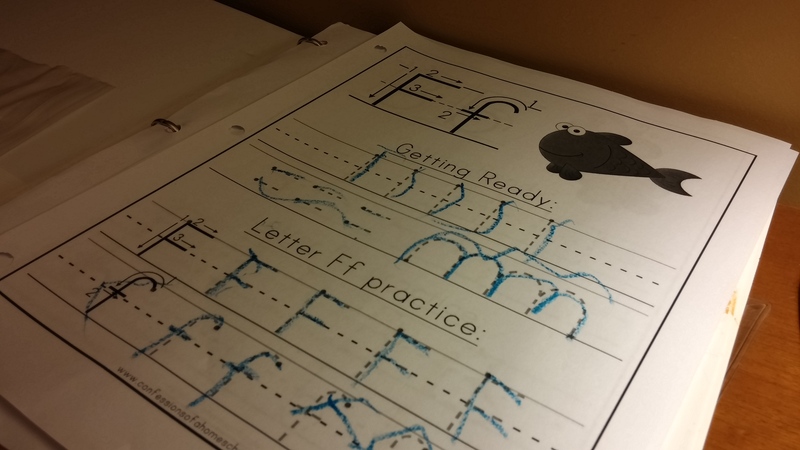 On Monday, we practiced with our letter F. We wrote them on the board and Maggie did a prewriting worksheet. Then we listed as many words as we could think of that started with F. (The word “fart” got a lot of giggles.) We finished the letter F activities with a F scavenger hunt. She still needs some help. 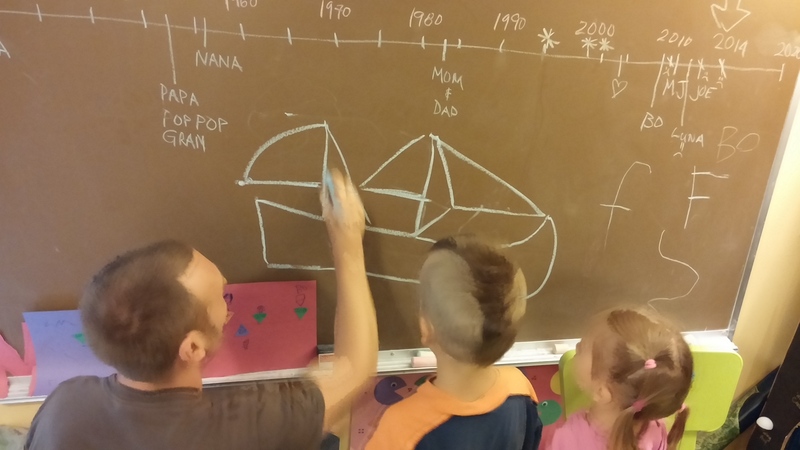 Then we went back to our basement school room and talked about timelines. We constructed one on the board starting in 1930 and ending in 2020. We found 2014 and practiced how to say what year it is. This was difficult because big numbers like 90’s and 80’s are numbers we hadn’t really covered before. Then I took suggestions from Maggie and Bo for dates to put on our timeline. Our birth years. When mommy and daddy got married. Even put grandparents’ birthdays and great grandmother Oa’s birthday on the timeline. Bo thought it was weird how everything was clustered in one area of the timeline. Then we opened the book and found the major dates in the history of the Harvey and added those to our timeline too. 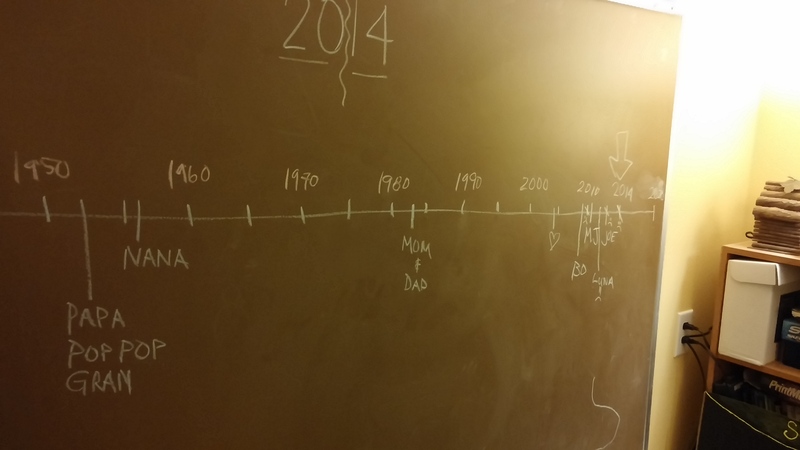 We made smaller timelines on paper for each of them starting with the year they were born and ending with 2014. Bo noticed that he had more events on his than Maggie did. Again, the years were hard because the numbers were big. On Tuesday, we learned all about David and Goliath. In the book, the Harvey is retired and considered pretty useless, but ended up being needed on 9/11. So I had them tell me how the two stories were similar. Bo had a memorized answer to what the story of David and Goliath teaches us: “Nothing is impossible with God.” So we ran with it. 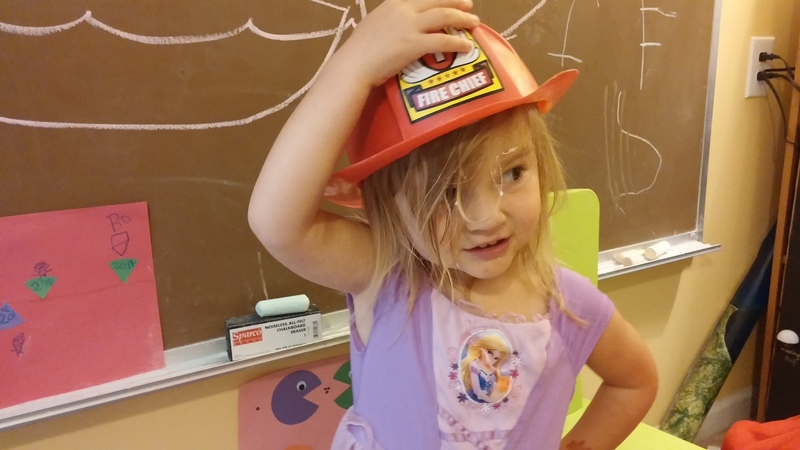 I think Maggie was having a harder time with it, but eventually she said she wanted to be brave like David. 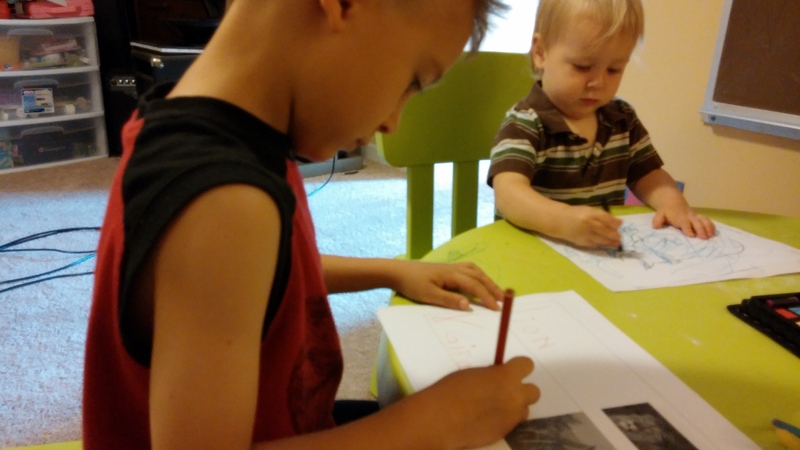 They drew pictures of David and Goliath and I had them repeat the story back to me using their pictures. 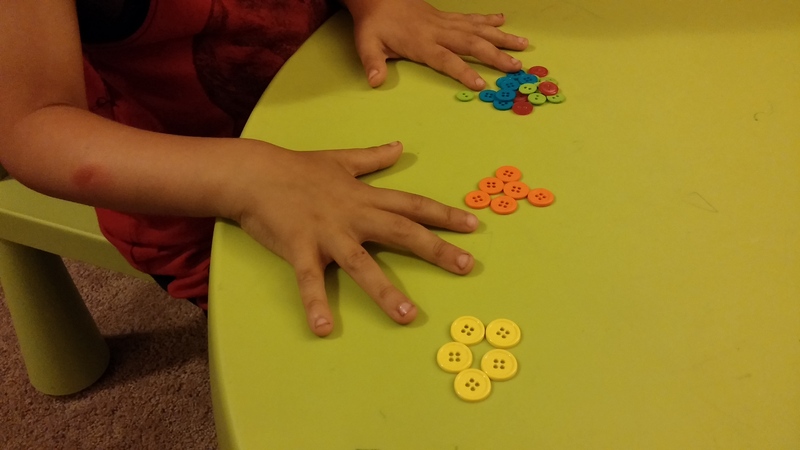 Maggie noticed the size difference between David and Goliath, so we reviewed the big/small lesson from last week and sorted buttons according to size. Also, Bo noticed that there were a lot of lists in the book, sho we practiced making lists of things. We talked about grocery lists and wish lists and Christmas lists. Then we listed things we love. 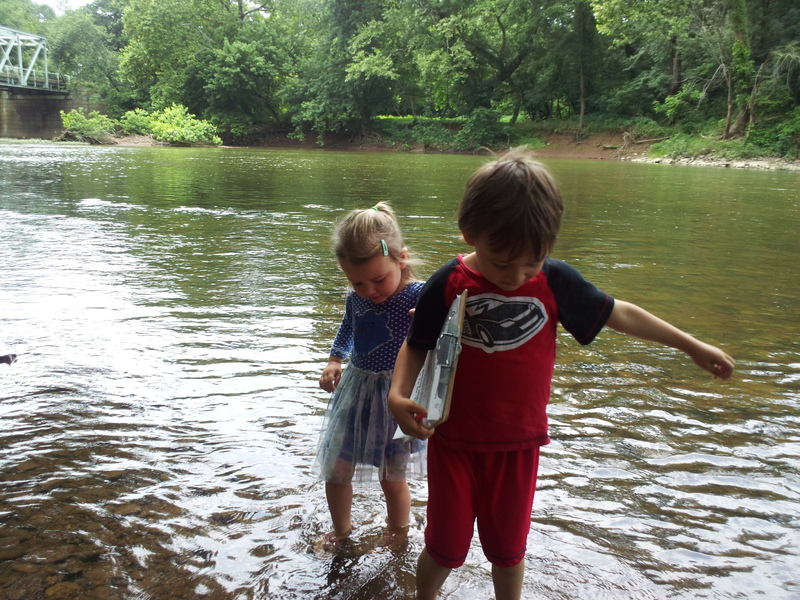 That was a full day and one where I let them take lead and explore. 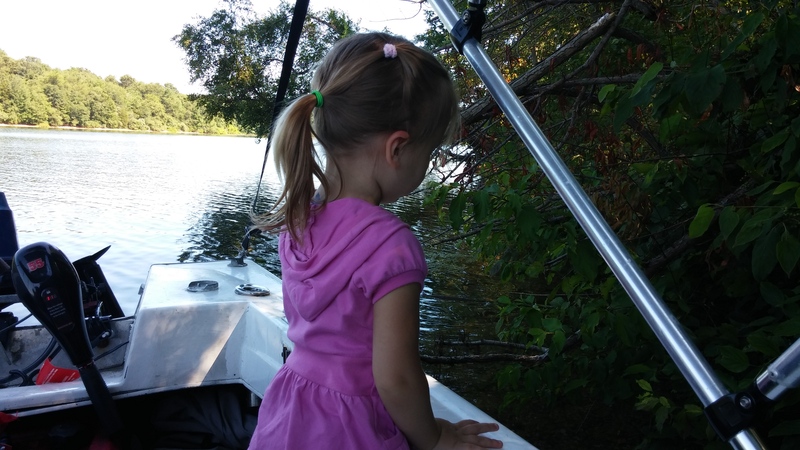 On Wednesday, I let daddy teach them all about boats. 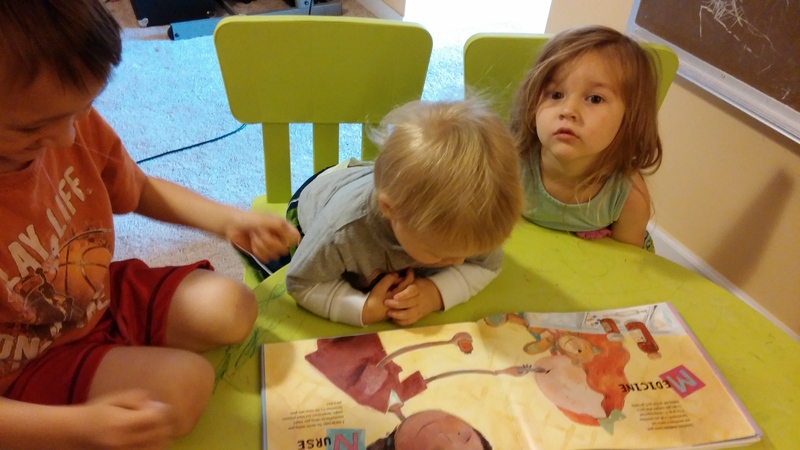 I thought at first that he was teaching over their heads, but Bo was really into it and even Maggie has repeated things she learned that day. We acted out rowing and steering and driving a boat. Maggie loved that. He took them on a historical tour of the design of boats starting with canoes and moving on through lots of different boats. 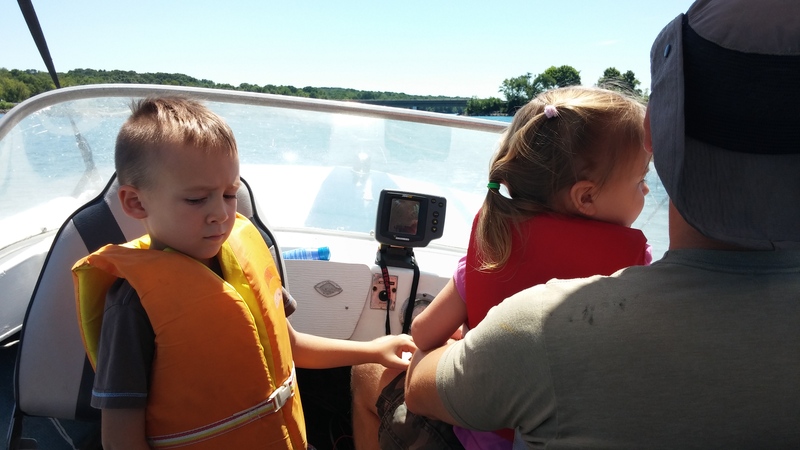 They learned terms like johnboat, runabout and center console. We also differentiated between displacement boats and planing boats. 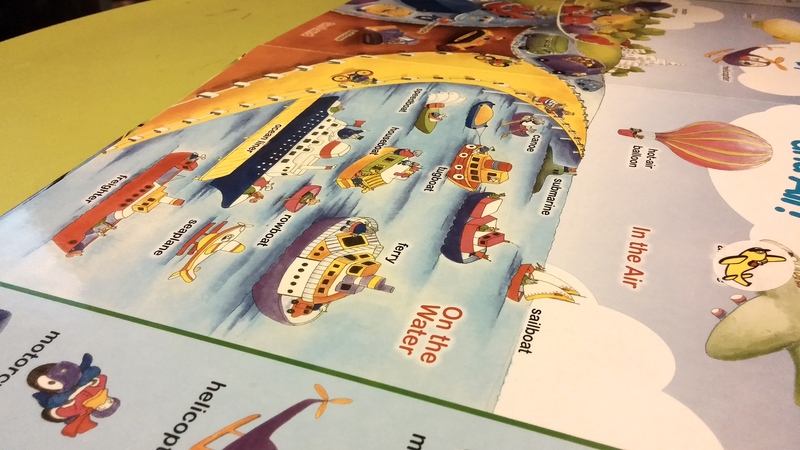 Then we used a picture boat to identify some of the boats in Fireboat. Ocean liners. Tugboats. Things like that. 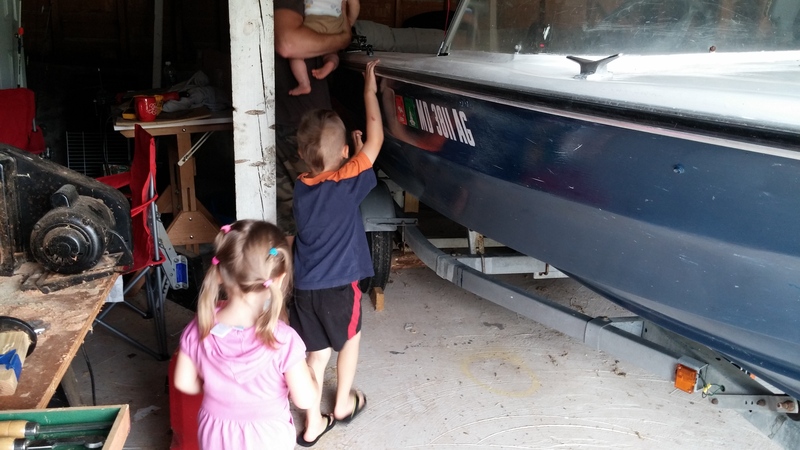 We took a field trip out to the garage and got in daddy’s runabout and learned boat vocab like bow and stern and all that. 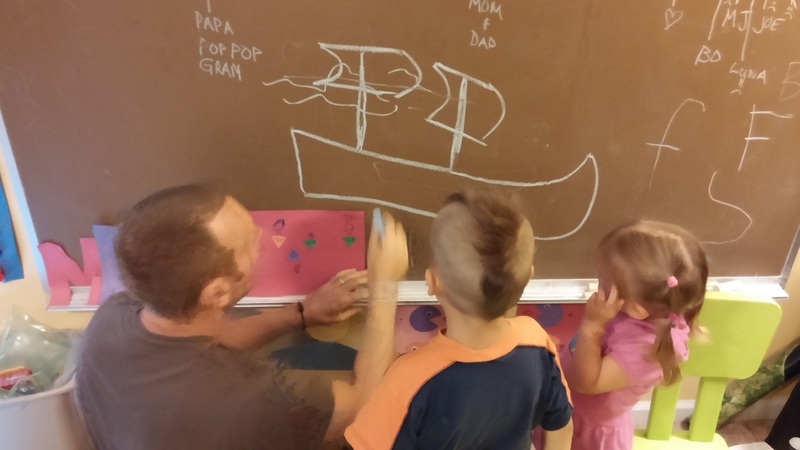 The kids really liked being in the boat and really seemed to be into learning the vocabulary. On Thursday, we learned all about NYC. We looked at lots of photos of things like the Twin Towers, Times Square, the Empire State Building, Central Park and the George Washington Bridge. I will admit that I partially cheated by letting them watch “Enchanted” – a movie they love so they could identify the landmarks we went over. We talked about the foods too (big deli sandwiches, big floppy pizzas, hot dogs and bagels) but Bo insisted that we have those foods too so it can’t be special about NYC. Friday morning, we continued with NYC and talked about 9/11. 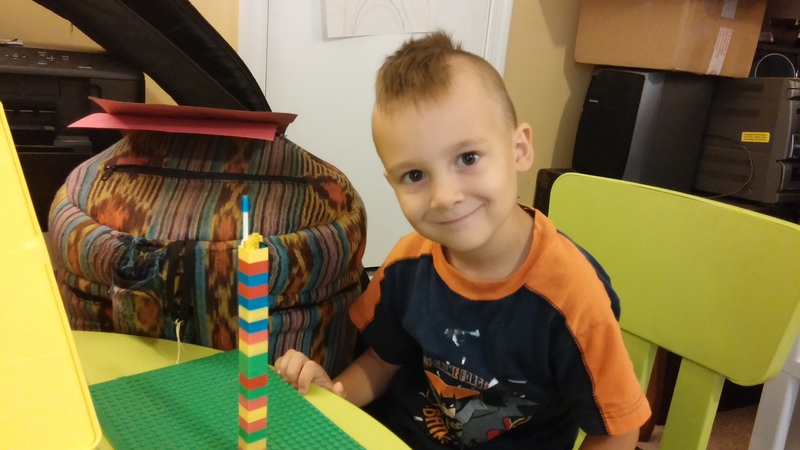 They built skyscrapers with Legos. We looked at photos of 9/11 and talked about what would happen to a building if a plane ran into it. We prayed for people who died and who had family die that day. We talked about being trapped and that led into a discussion about heroes. We moved pretty seamlessly into talking about public servants like doctors, fire fighters and police officers. 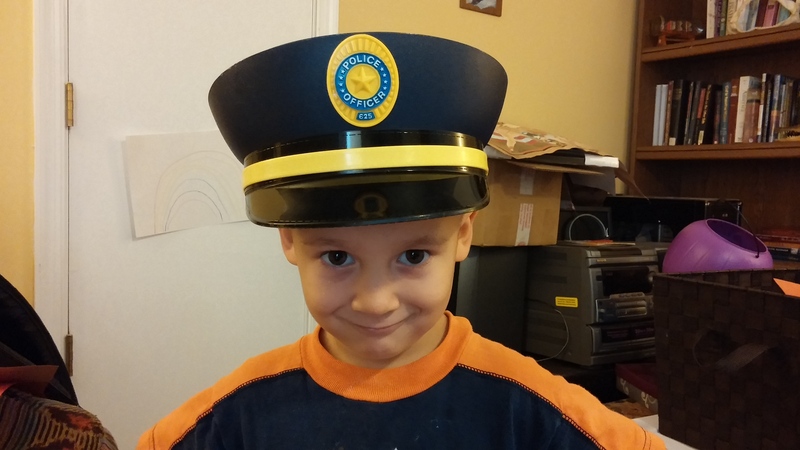 We borrowed some dress up uniforms from a friend and they each dressed up as something. Then we talked about what they would do in case of a tragedy like 9/11. They loved this. We prayed again and thanked God for them. I had every intention of having them do some exploration of who their heroes were and stuff like that, but having had a rough week personally I felt like they had done enough. 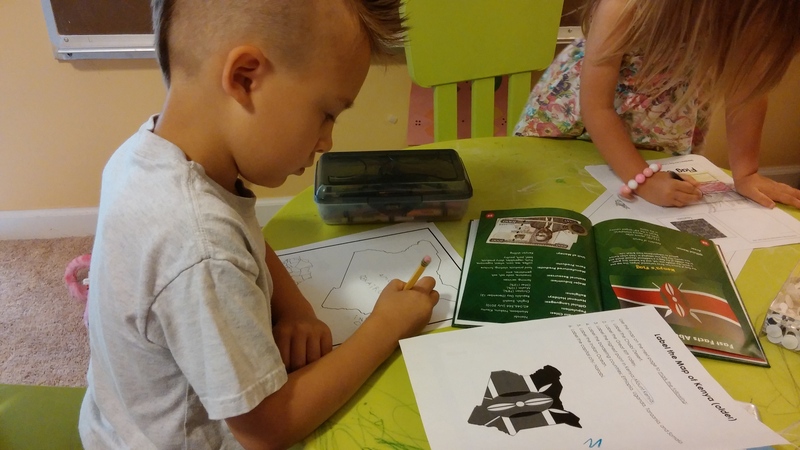 This week we are taking the week off so we can reinforce their Vacation Bible School lessons instead. 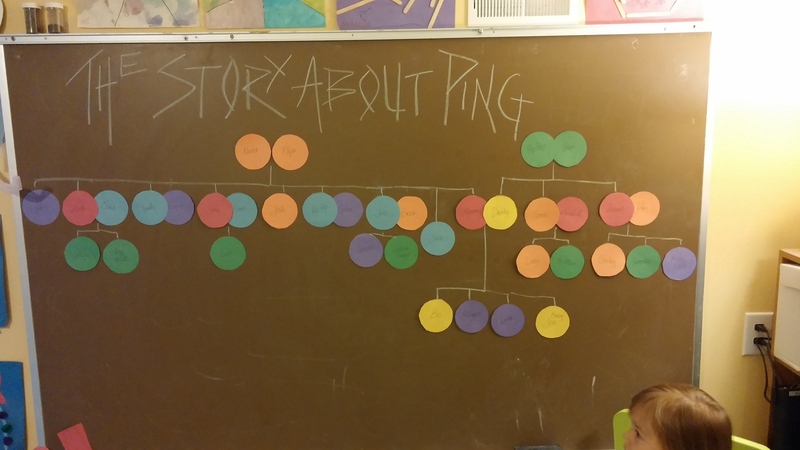 After that, we will be studying The Story About Ping. Again with a late update. This week was a little busy because my husband and soon were participating in a summer wrestling camp at MACA until lunchtime. We had to save school for after naps which didn’t leave us too much time for much. 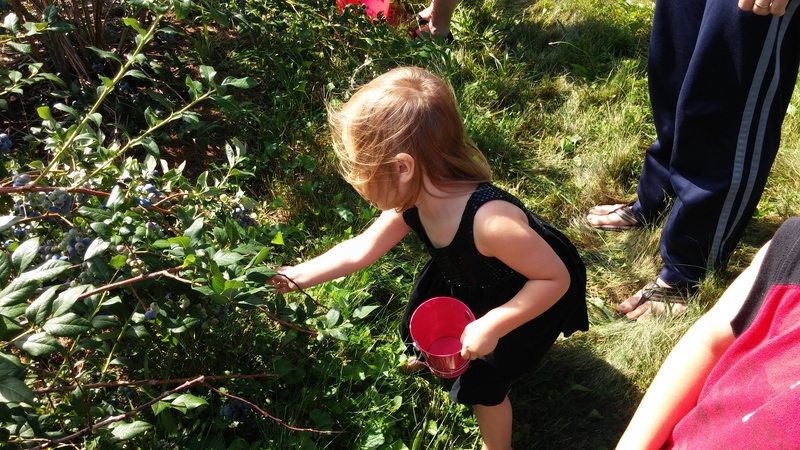 I moved our schedule around a bit so that we could go blueberry picking during this week and do the book Blueberries for Sal by Robert McCoskey. We love this book for its clever story about a girl and get mother who encounter a bear cub and his mother while picking blueberries. Then the edition of the book we own came with a CD of songs and activities which we did. 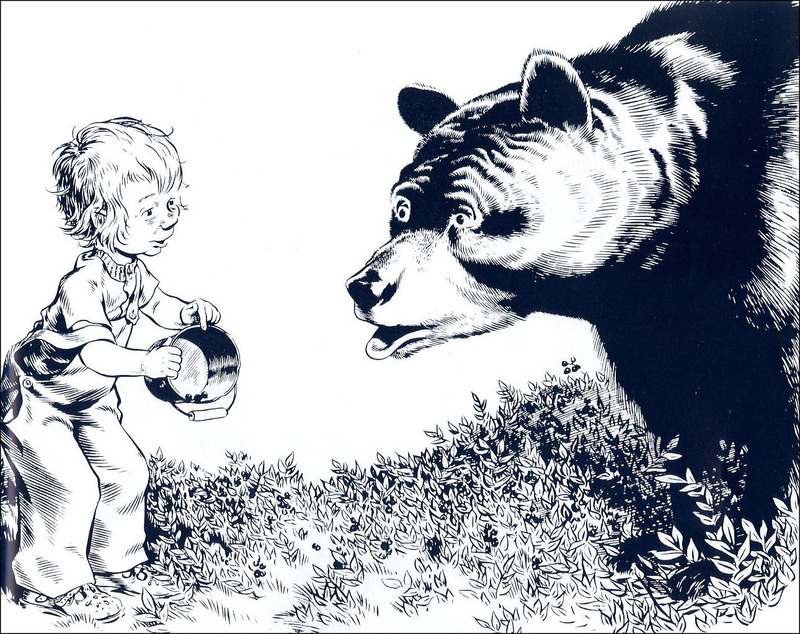 The changed some popular songs to feature bears and blueberries like “Here we Go Round the Blueberry Bush” and “Ten Little Blueberries.” Maggie, just having gotten up from her nap was a little reluctant to participate, but Bo was all over it. I took lots of pictures but then switched phones and can’t find them. We took a break on Tuesday so that could go out to eat with my mother. 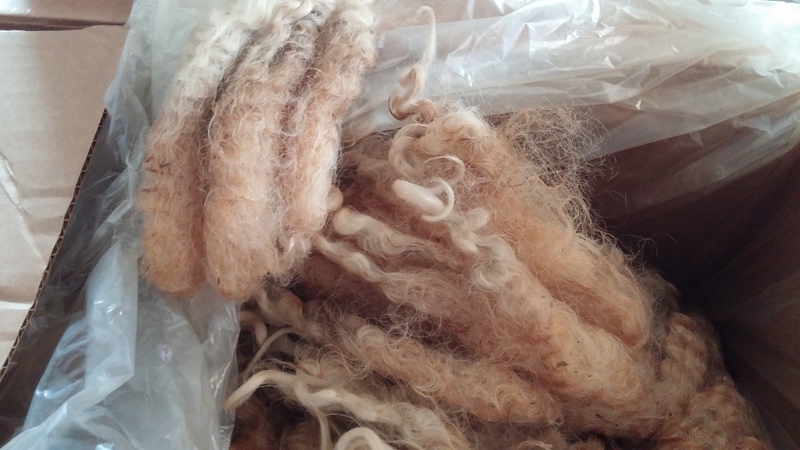 On Wednesday, we concentrated on the parables from Luke 19 – the Lost Coin, the Lost Sheep and the Prodigal Son. Patrick told them the parables and we talked about what parables are for. We reviewed a bit about symbolism that we discussed last week. Patrick explaining to them the parables. 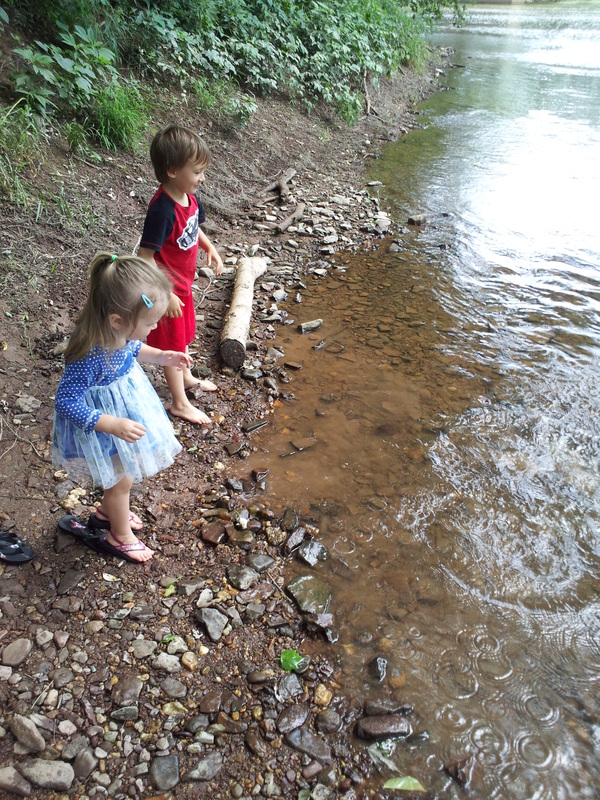 We hid a coin and had them search for it. We did this a few times and then they were pretty bored with it. 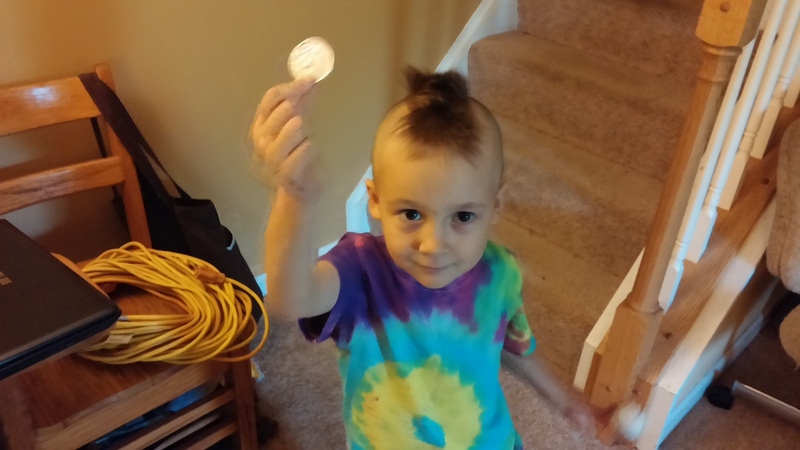 Bo proudly displaying his coin. 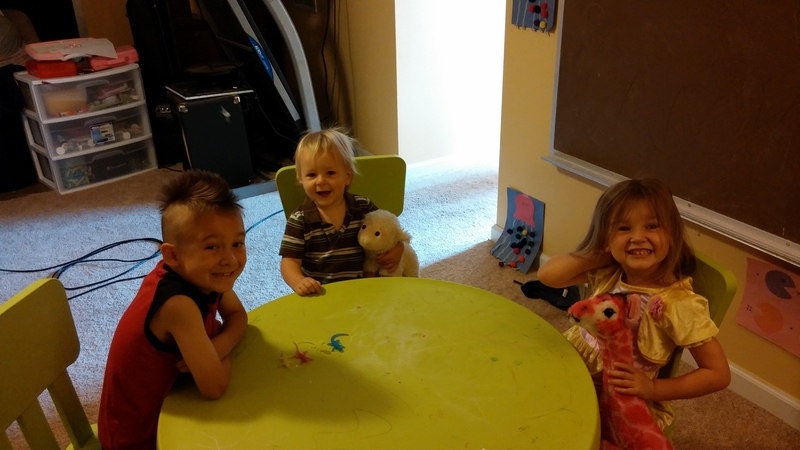 And his mohawk. 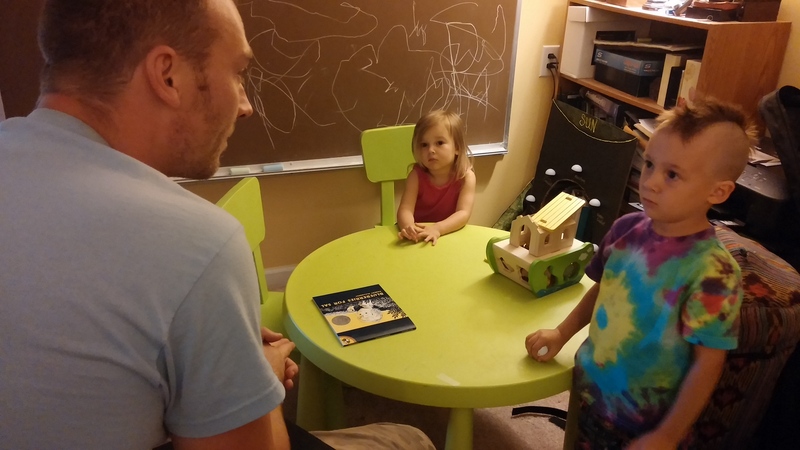 We then acted out the Prodigal Son, which was pretty interesting with a four year old and a two year old. It was more like readers theatre or probably more accurately repeat-after-me theatre. But they liked it and they really liked running throughout the house to find props. 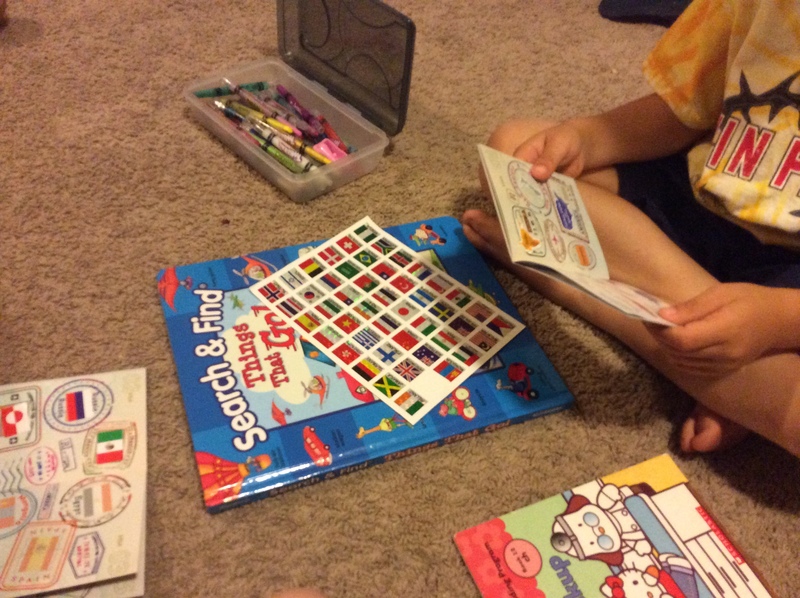 We talked about being lost or found. 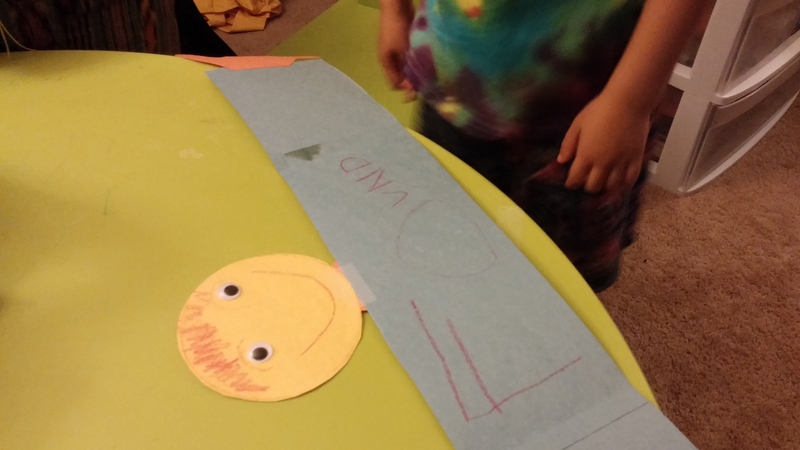 Then we made paper “hugs” Because they really liked the part of the story where the father greets the Lost Son with a hug. Maggie decorated hers and Bo wrote “found” on the inside of his because he wanted to be sure that everyone knew he was found and not lost. Bo took this picture himself. 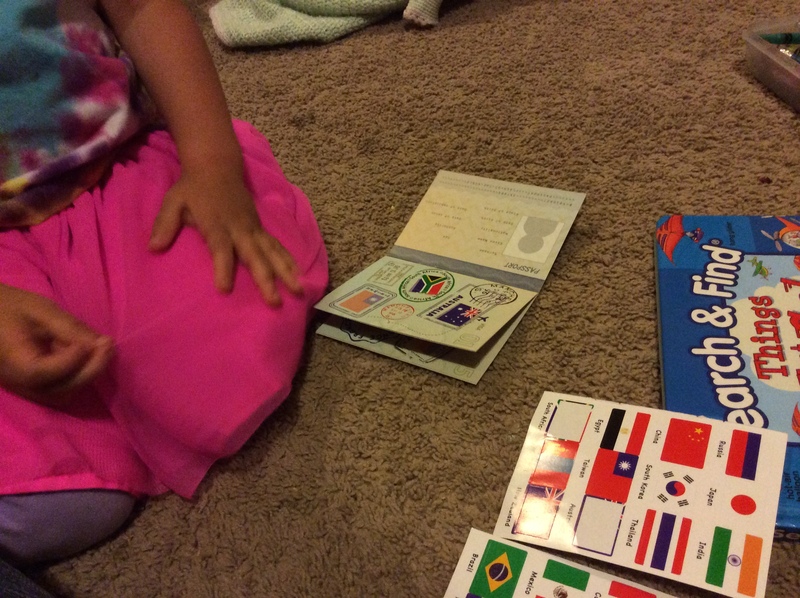 On Thursday we talked about differences. We started with bigger than/smaller than. In the story, there is a small girl with her bigger mom and a small bear with his bigger mom. 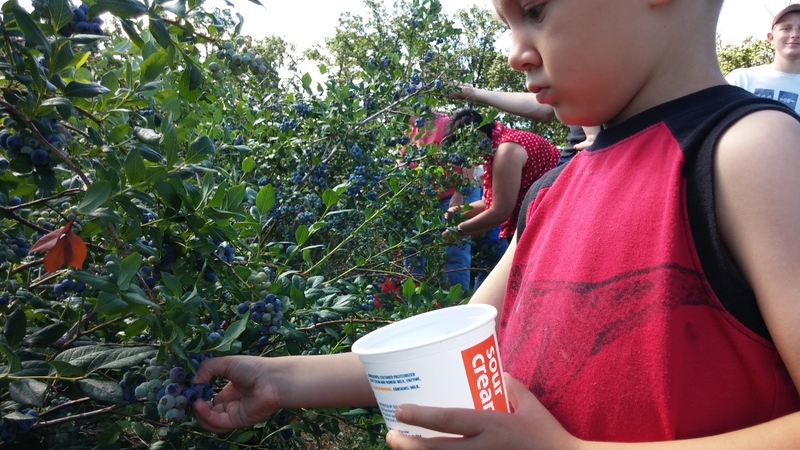 The story also compares the size of Sal and her mom’s buckets and compares the amounts of blueberries they picked. So we moved from size to number – greater than/less than. 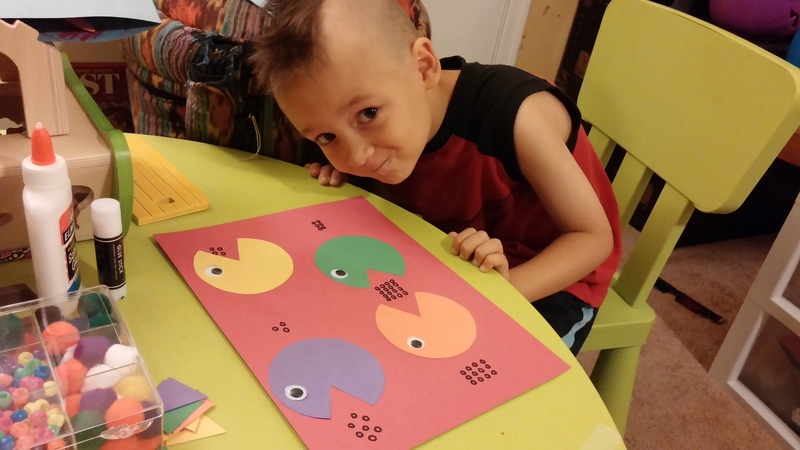 I made them little Pac-man style monsters that they could use to practice figuring out which was greater than the other. 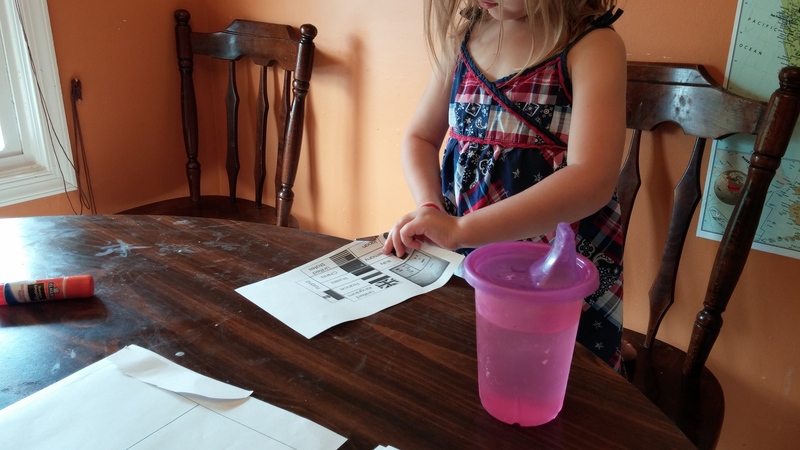 There were a few different worksheets I made them. 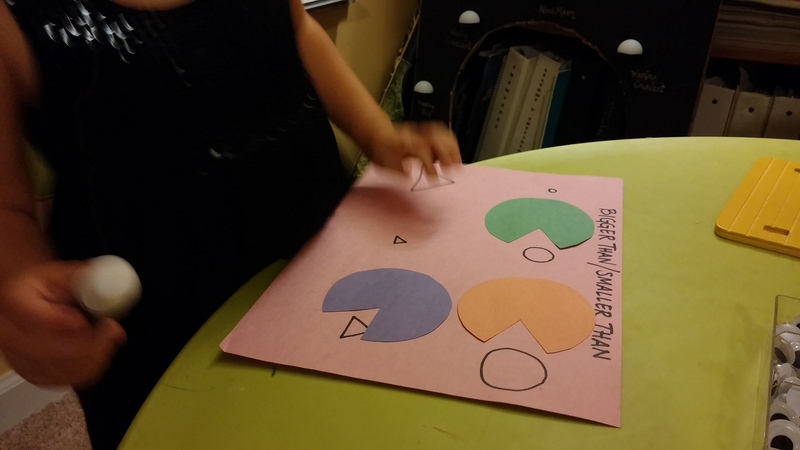 One with dots they had to count, one with numbers and one with shapes of different sizes. They were very excited to put googly eyes on their monsters too. 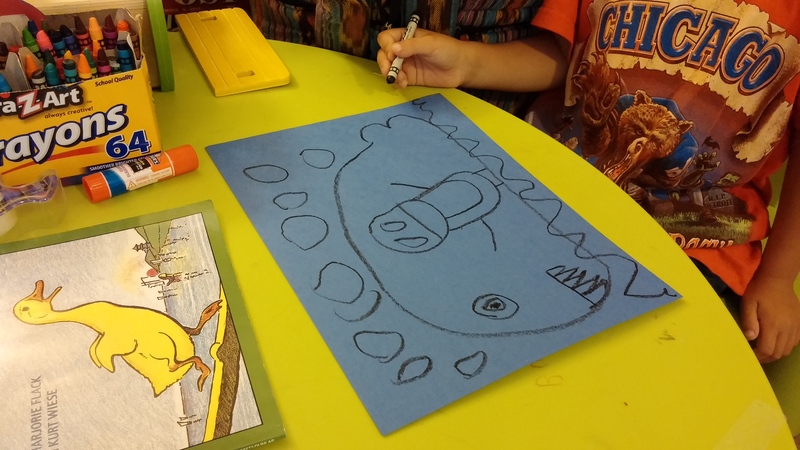 Then we saw that the mouths of their monsters were very much like the greater than/less than sign (does that sign have a proper name?) and we practiced that on the board. We only did this briefly because I honestly don’t think the sign is the important part. The last thing discussed this day was how some things can weigh more than something else and that is different from overall size. 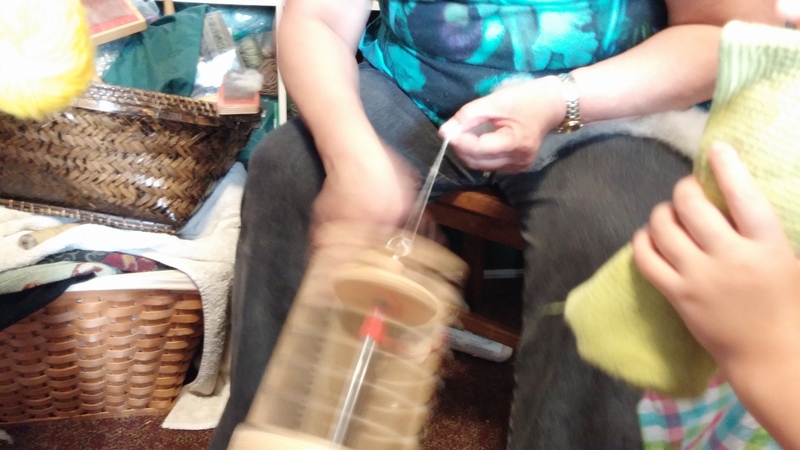 We constructed a scale out of a dowel rod and two baggies. Then predicted which object would be heavier and then we tested. A little intro to the scientific method, of course. 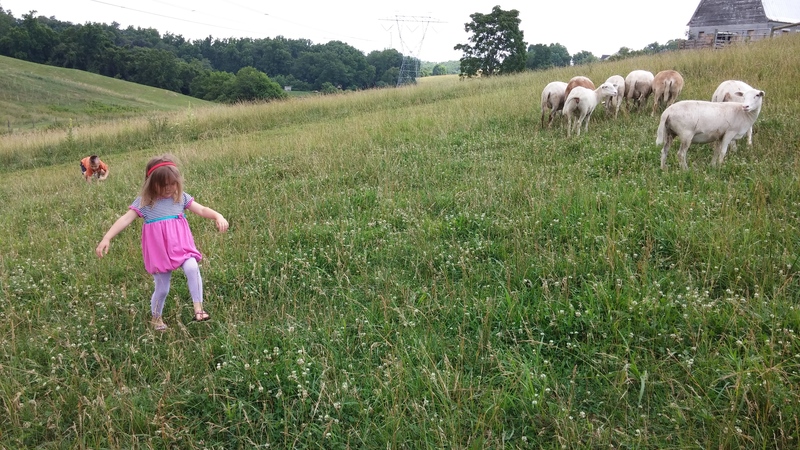 Maggie is ornery and would always pick opposite of Bo even if Bo presented a good case. But they liked it. Friday morning was a beautiful, breezy, warm day and was perfect to go blueberry picking. We went with my mom (Nana) and it just so happened to be her birthday, so practiced our B sounds and made her birthday cards. I found a little tin pail like the one in the book and we let Maggie carry that to put berries in. es in the pail to see if it sounded like it does in the book: kuplink, kuplank, kuplunk. And we talked about other words like that. Drip drop. Flip flop. I had every intention of making a bean bag toss but had a busy week and with the fourth of July we had a good time with family instead. 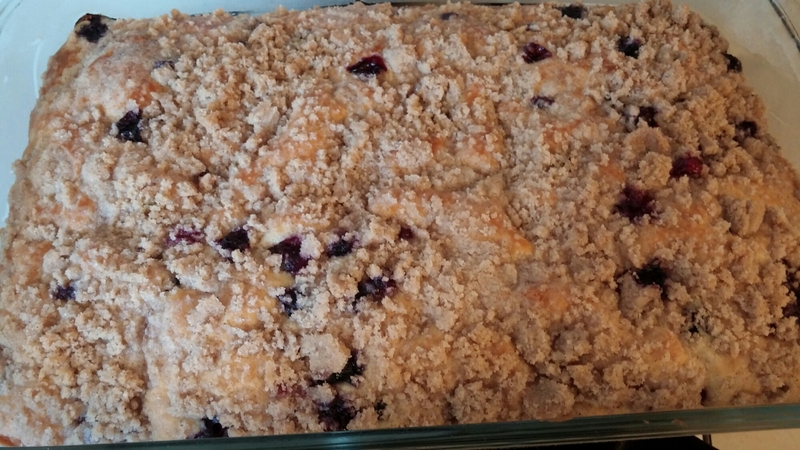 We baked some blueberry buckle together and that was enough for us! Next week is Fireboat by Maira Kalman. Looking forward to a normal(ish) week. Sorry my post this week is so late – we have had a busy weekend and I took the time to deep clean my kitchen instead of updating the blog. This week, we studied We’re Going on a Bear Hunt by Michael Rosen. This is a repetitive story that lends itself to hand motions, which is the very first thing we did. 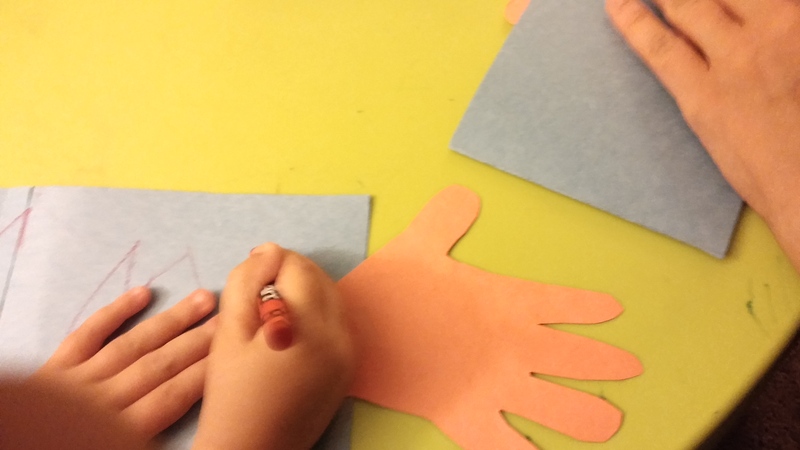 We read through the story once and then went through it again making up hand motions together. I would ask, “What hand motion would show a deep, cold river?” and they would make suggestions until we picked one everyone liked. 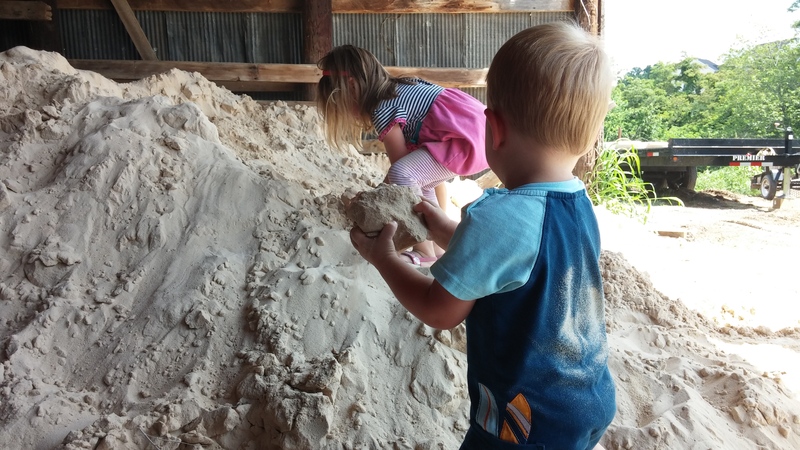 Once we figured it all out, the kids wanted to do it over and over again. All day. All week. Even now that we’re done with the book. 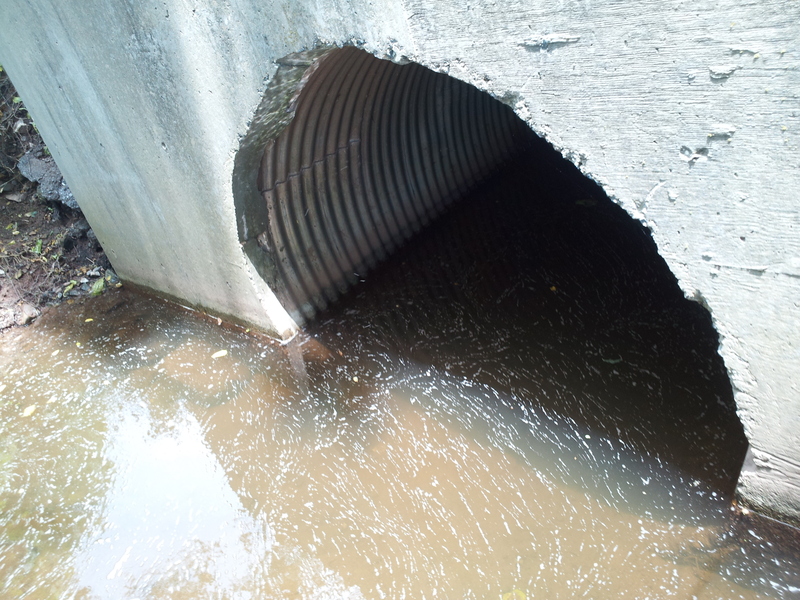 In the book, it says “We can’t go over it/We can’t go under it/Oh no! We’ve got to go through it!” So we talked about over/under/through and other locative prepositions and practiced with a tunnel that we have. We practiced going over and under lots of things and talked about how some things are easier to go over or under and others are more difficult. We then used gummy bears (sticking with the bear theme) to demonstrate these prepositions. 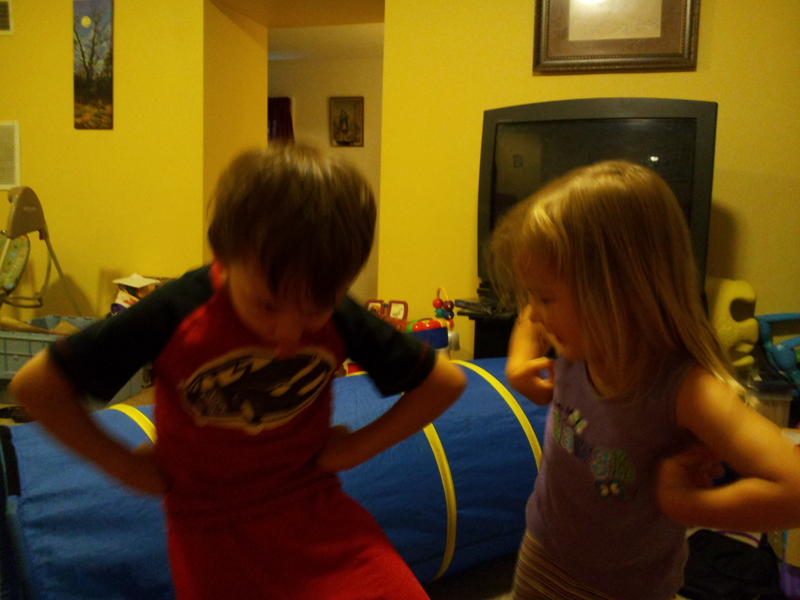 They got bored with this pretty quickly, I think because they already understood pretty well. We reviewed our senses from the week at the beach and practiced using them to make observations. Then we talked about what an adjective is and what it means to describe something and practiced describing all sorts of things. 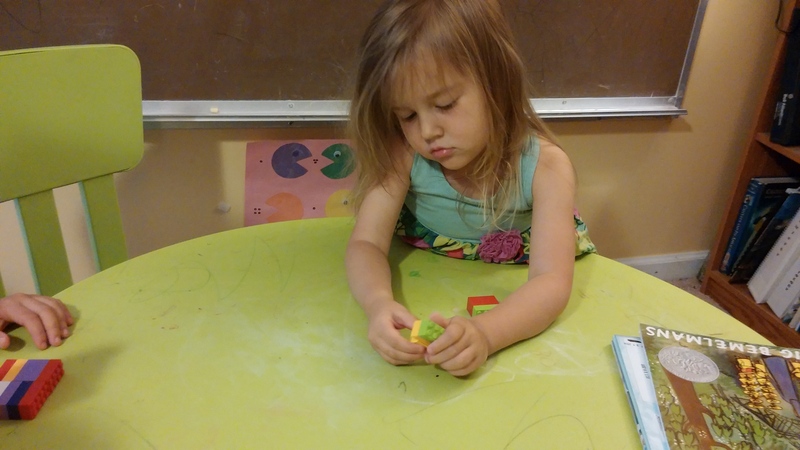 “Gummy bears are delicious!” “My hands are sticky!” “These are squishy!” They weren’t ready for school to be over, so I let them work in some workbooks on things like patterns, colors, shapes and letters. They really loved working in these, especially when bribed with gummy bears. 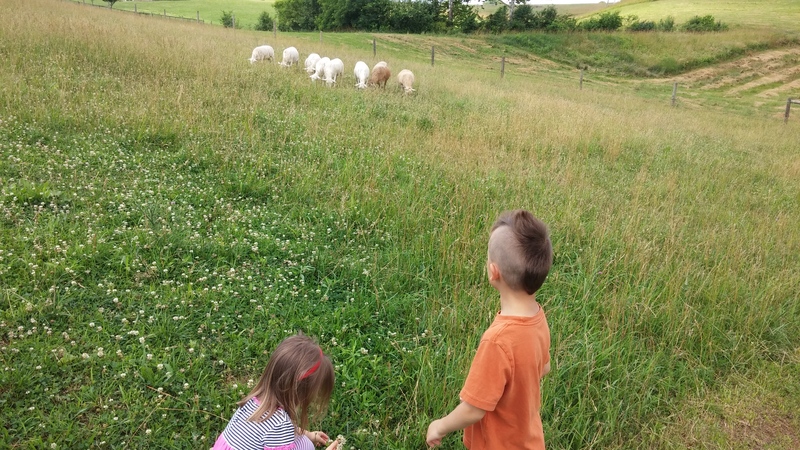 On Day 2, Patrick took the kids out on a Habitat Scavenger Hunt to find each of the environments mentioned in the book (grass, river, mud, forest, snowstorm, cave) and they had a blast running around in the forest and splashing in the mud. Maggie asked if she could take all her clothes off and run around in the river. Of course, a couple of the environments were hard to find, so we had to improvise. This was our cave. For the snowstorm, we let them stick their faces in our freezer. Bo carried a clipboard with everything listed on it and was a little upset when they didn’t do them in order. 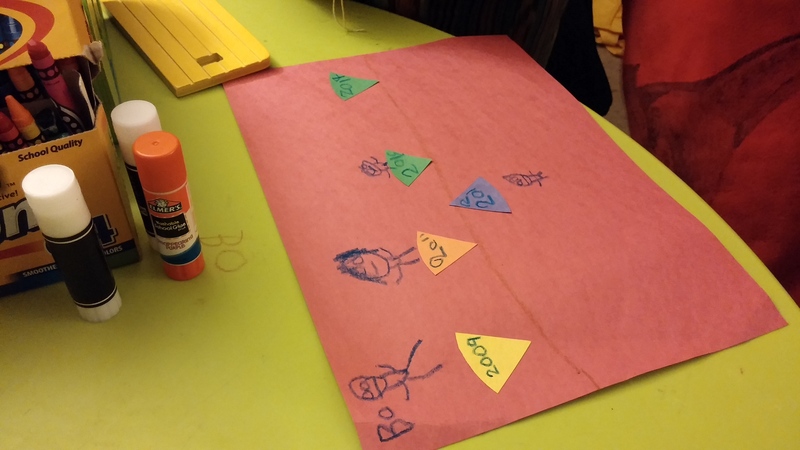 After they came back, we made story paintings. I pasted a paper cave in the center of the paper and separated the remaining space into five sections – one for each of the environments. 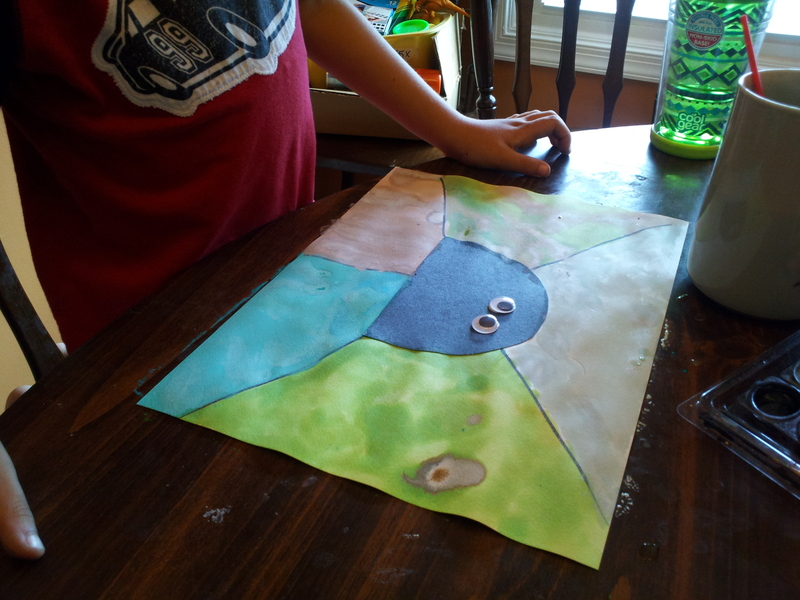 Then the kids painted the environments into the sections. Green grass. Blue river. Brown mud, etc. Bo was very methodical and painted the whole section. Maggie had much less patience. Then we glued some googly eyes in the middle of the cave for the bear in the cave. 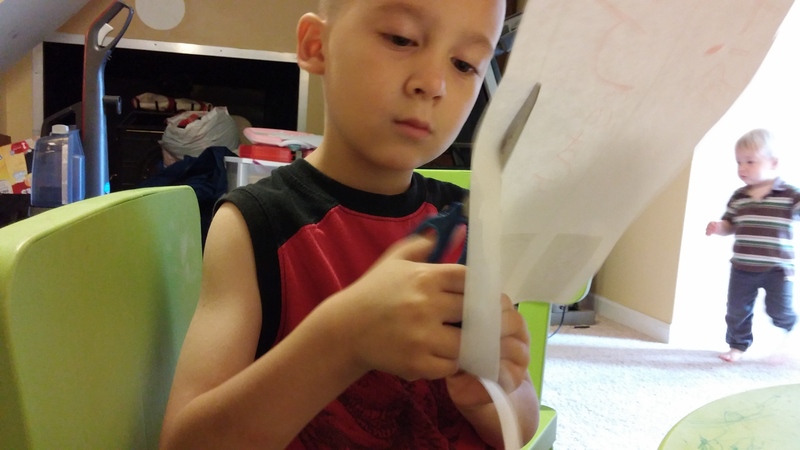 Bo was so excited to use the glue himself. We talked about what a habitat was and went through each one and listed animals that lived in them. Bo was very excited about crayfish living in mud because he had found one when they went on their Habitat Scavenger Hunt. Day 3 was all about Bears. Bears are my favorite animals, so I was excited about this. 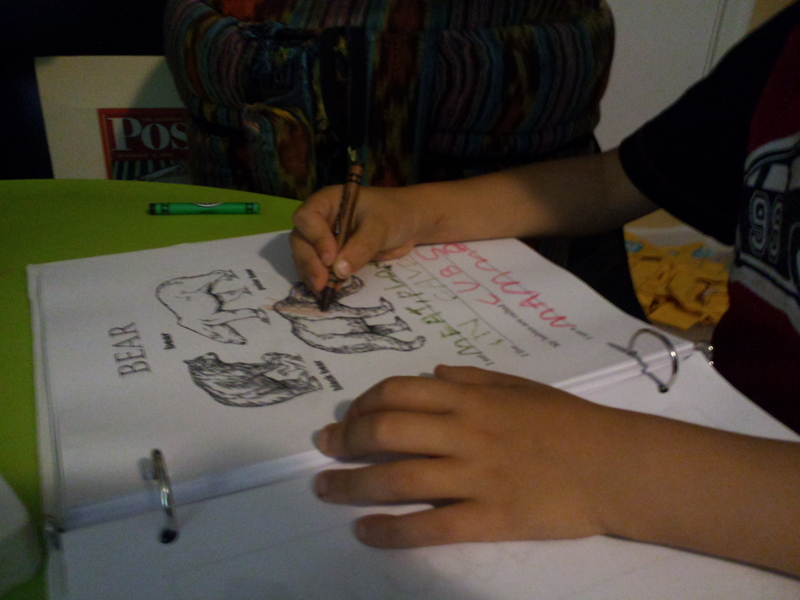 We filled in our animal information worksheets and practiced terms like carnivore and omnivore. We looked at photos of various species and watched some videos. We compared species and mentioned how to tell the difference, so Bo knows to look for the shoulder hump on a Grizzly bear now. 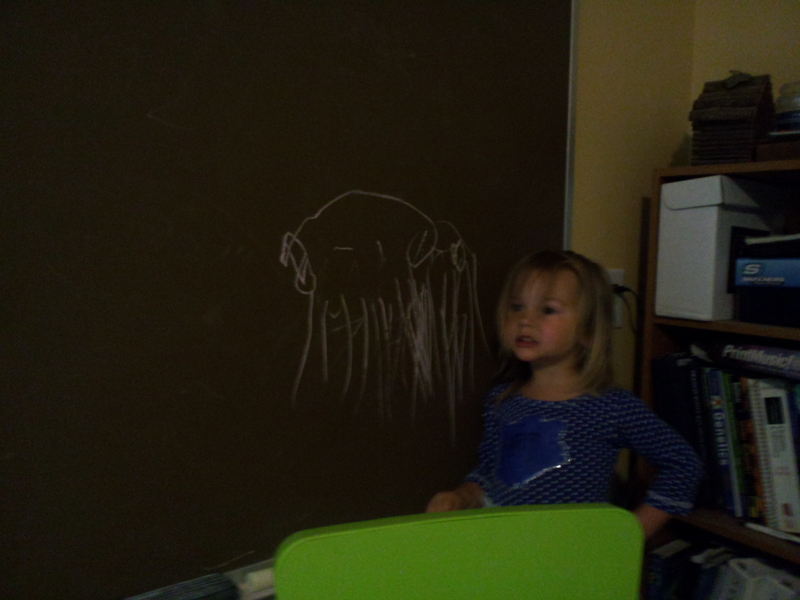 Maggie drew a bear on the board. Then we talked about how we can compare things in a simile using the word “like” because I wanted to link bears and my Dad (their Papa) in their minds. My dad died suddenly in April and he was obsessed with bears (both Chicago and the animals). So, we looked at a photo of him and talked about how he is like a bear. “Papa is big like a bear and strong!” “Papa likes to eat meat and plants like a bear.” Then we talked about how symbols and images can help us remember someone. We went around the house and looked at the pictures hanging up – we have a moon painting by my Aunt Bim to remind us of our baby Luna, a bear painting to remind us of Papa, drawings by Uncle Jake and Aunta Nina’s handprint. 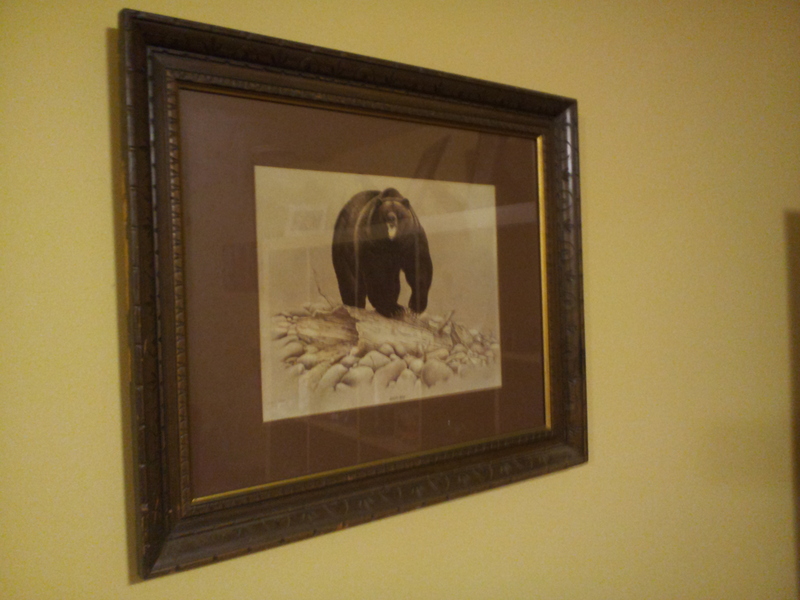 My dad gave me this picture of a bear that hung in their house for as long as I can remember. It’s always been my favorite. We practiced with other similes and I said “Bo is like a strawberry because his shirt and shorts are all red.” We then had a lesson in the difference between metaphors and similes because Bo said if he was a strawberry he’d be small and a triangle and covered in seeds. So we talked about how being LIKE something and being something is different. We ended the day by reading several other books starring bears. There are a lot of them – even in our collection. On Thursday, we learned all about Noah’s ark. I told them the story and we talked about a few different lessons we can learn from it. We talked about following God’s directions even when they seem ridiculous. We talked about being righteous when everyone around you isn’t. 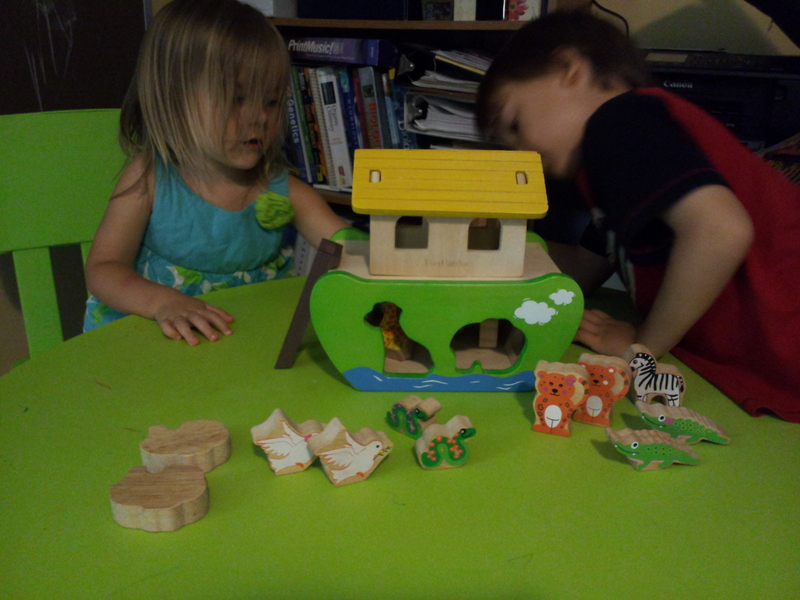 Then we acted out the story using a wooden Noah’s ark set we have. Then I gave each of them a pile of popsicle sticks and a sheet of paper and told them to build me an ark. I didn’t give detailed instructions (although, thinking back on it now, that would have illustrated how Noah followed God’s directions well), but they had fun trying to build something that looked like an ark. Bo’s actually did look like a boat! Bo drew a pair of bats in his ark. Then we talked about the number 2. 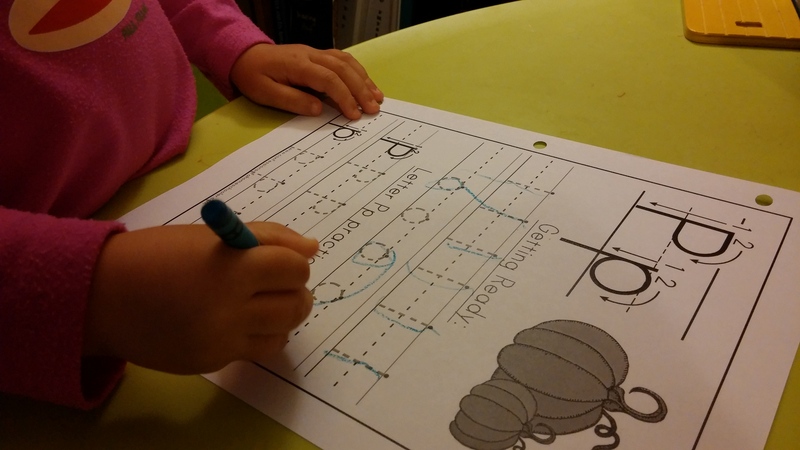 We practiced writing two’s on the board and did a couple of worksheets. Maggie is not interested in those pre-writing activities and could not follow the lines and didn’t try to. 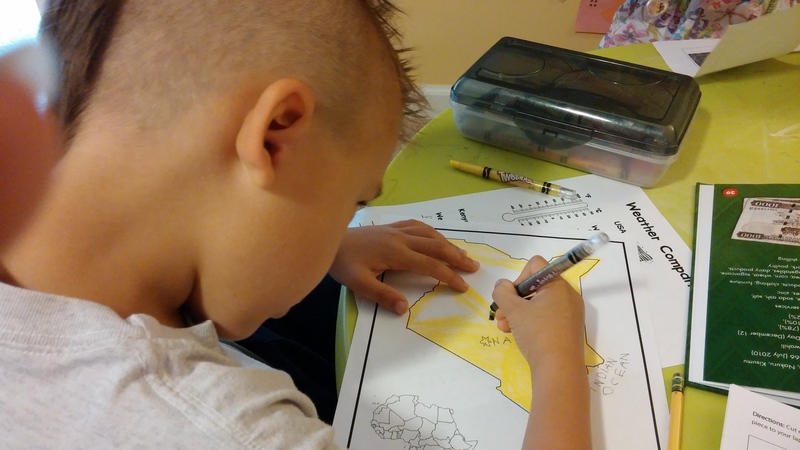 Bo can do his worksheets completely on his own now and was done in record time. Maggie circled her 2’s instead of trying to draw them. 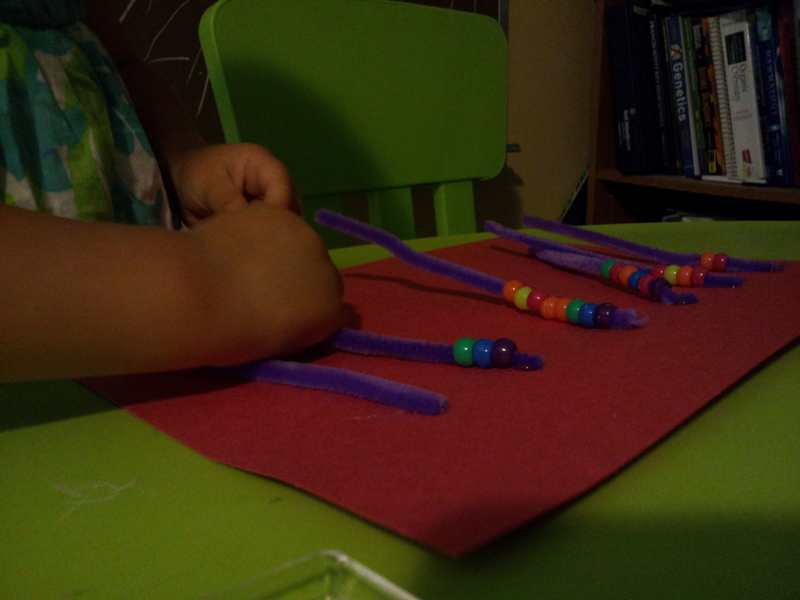 Maggie’s chubby fingers stringing beads. So cute. 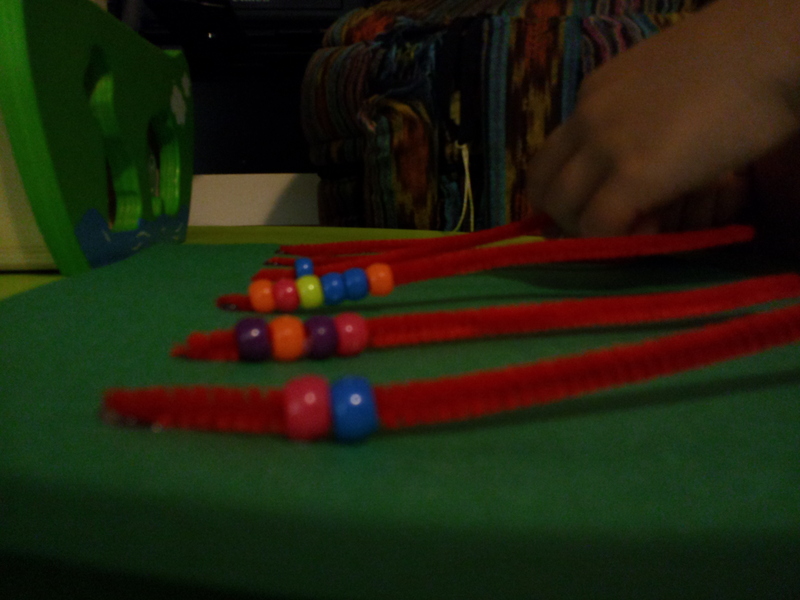 Bo practiced his mental math by adding two to each number to figure out how many beads to put on the next pipe cleaner. Then we took the beads off and counted how many beads we used total. Friday was a special treat. We had spent the night at our Oa’s (my grandmother’s) house and left early to go to the National Zoo in DC with my sister Jes and her daughter Lo. 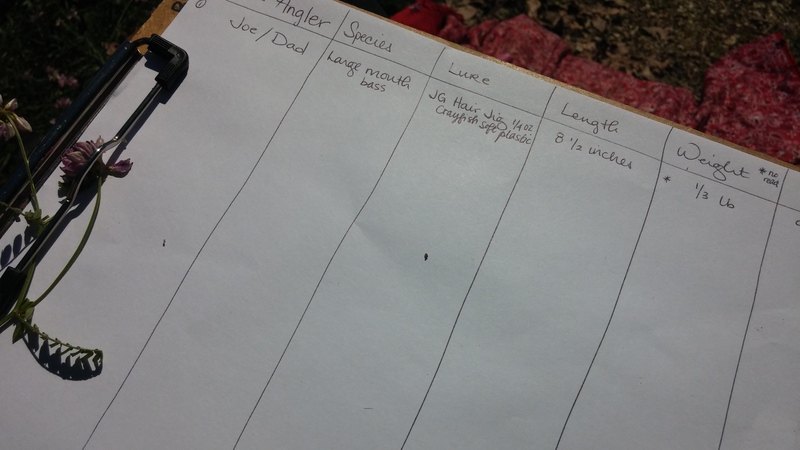 We had spent a little time the night before creating a checklist of animals we wanted to see at the zoo (so we could ‘hunt’ for them), but we left that list in the car back at the house when we walked to the metro. 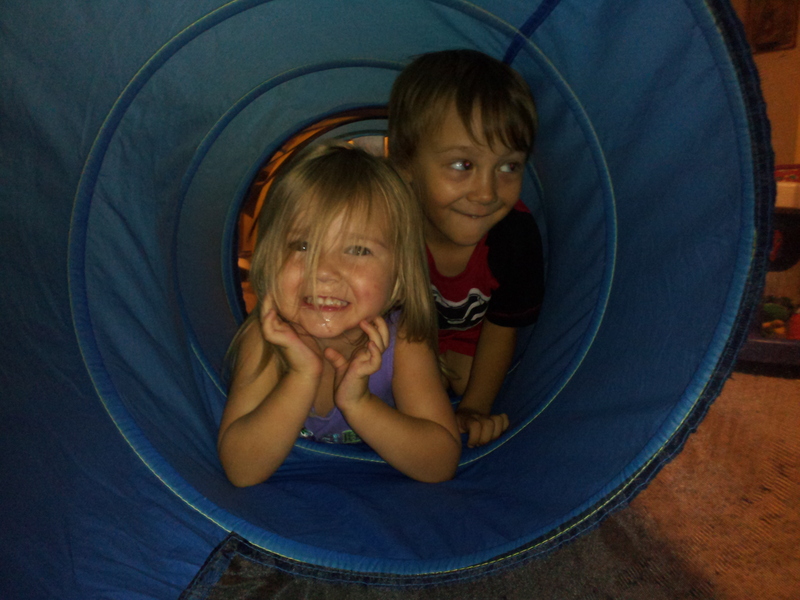 The metro was a fun adventure for them too because my kids are country bumpkins who don’t know what escalators and elevators are. 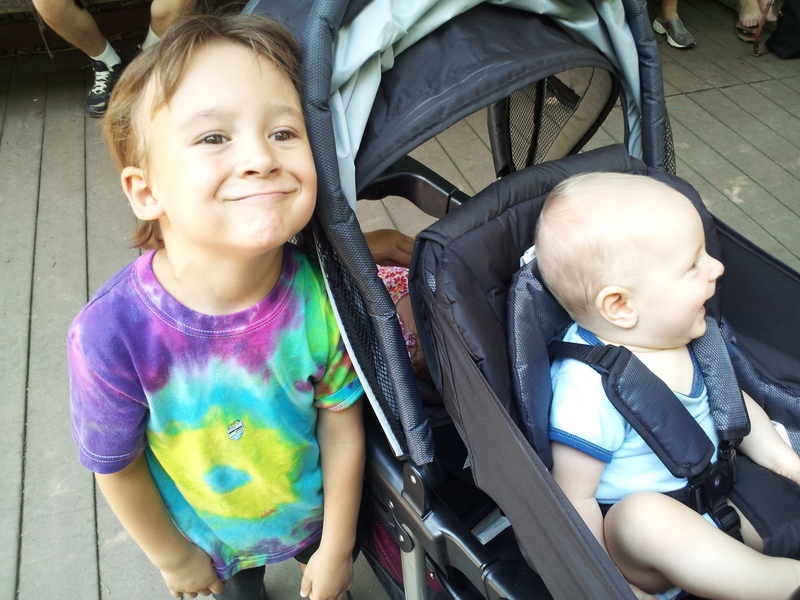 I carried Joe and Patrick pushed our other two in our double stroller. Jes used her double stroller for Lolo and lunch (yes, lunch took a whole seat in a stroller). We saw all kinds of animals, but oddly, no bears. We did see otters napping in a tree stump. Tigers stretched out in the shade. Elephants throwing dirt on their backs for sunscreen. Snakes. Owls. Gorillas. Zebras. Crocodiles. Pandas hiding in the trees. Orangutans swinging on cables over the crowd of people. But Bo’s favorite of the day was the lion. The big male lion was up and walking around and we got to watch him take a drink, pee, poop and roar before lying down to take a nap. I’ve been to the National Zoo once a year for almost my whole life and I’ve never seen the lion that active. I think this is when they were trying to find the panda hiding in the tree. It was a long day and a warm day, but it was a lot of fun. On the way home in the car, we went over our checklist and then we rewrote We’re Going on a Bear Hunt to be “We’re Going on a Zoo Hunt” and we changed the environments to animals and practiced animal noises. (What do zebras say, by the way?) Then when we got home, we drew pictures of our favorite animals at the zoo and snacked on Teddy Grahams. I had every intention of organizing a bear scavenger hunt where I hid baggies of Teddy Grahams and made them review the stuff we learned this week to get them, but I was beat after walking all over the zoo. 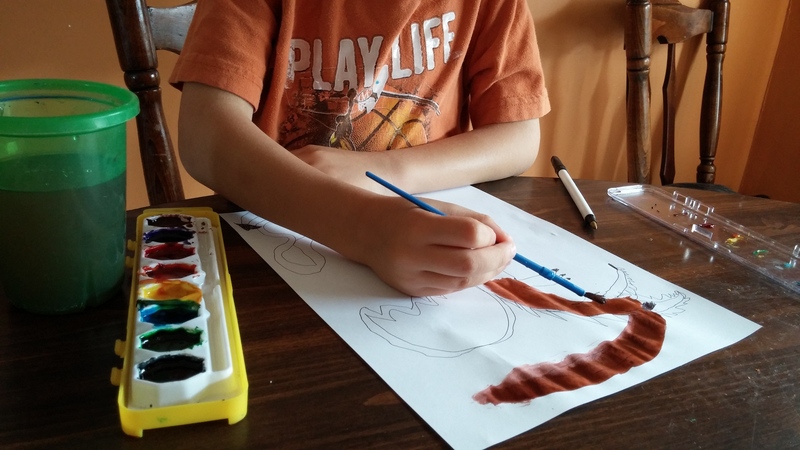 Bo drew a King Cobra. 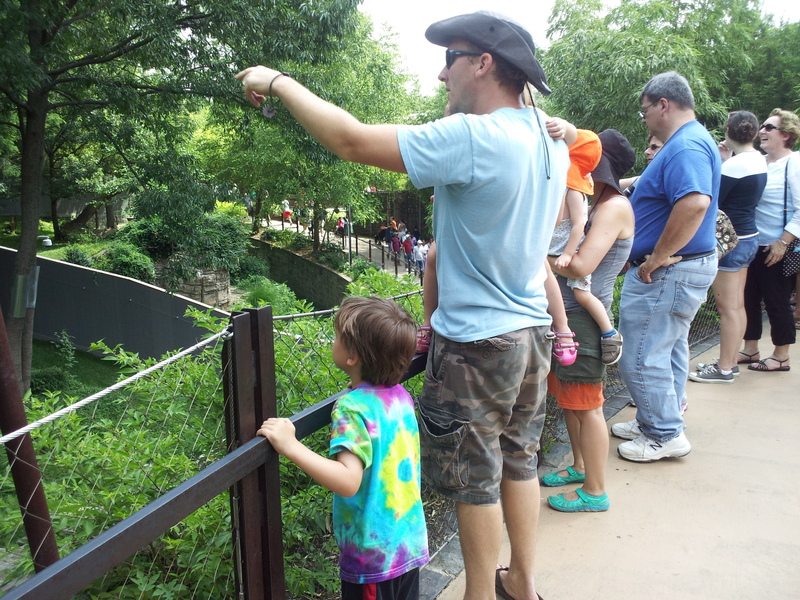 That was his favorite animal at the zoo, but the lion put on the best show. Originally, I was going to do Fireboat by Maira Kalman to align with the 4th of July (it’s about a fireboat in NYC on 9/11), but because my favorite place to pick blueberries put out its blueberries sign, we will be doing Blueberries for Sal by Robert McCloskey.